I am a huge Masterpiece Transformers fan, the only Transformers line I still collect on a regular basis and proudly display for all to see. 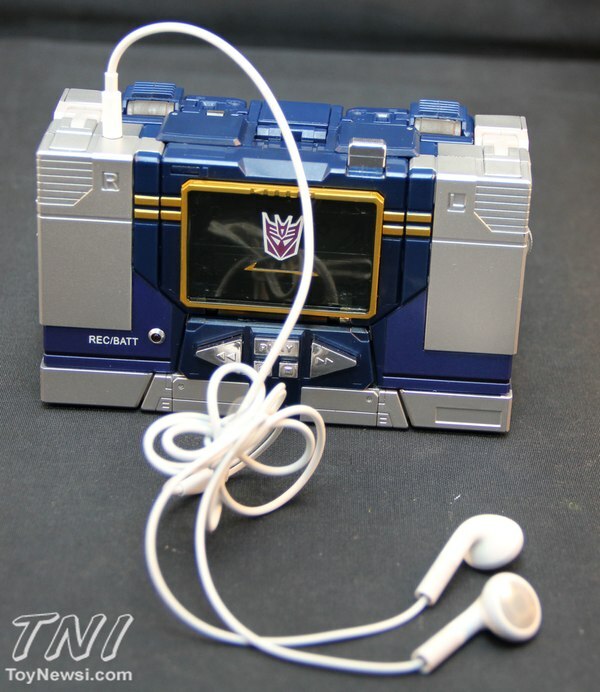 The day Soundwave was announced, I knew without a shadow of a doubt I would be adding it to my collection. 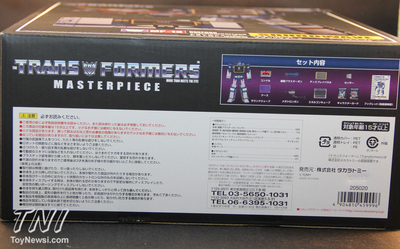 So to say I had very high expectations for this figure would be a bit of an understatement. 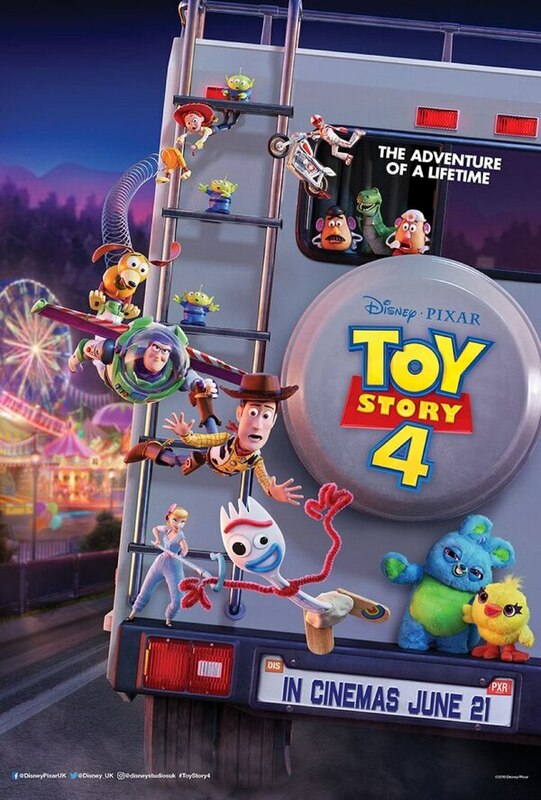 Check out my review below and see if the latest Masterpiece lives up to my expectations. 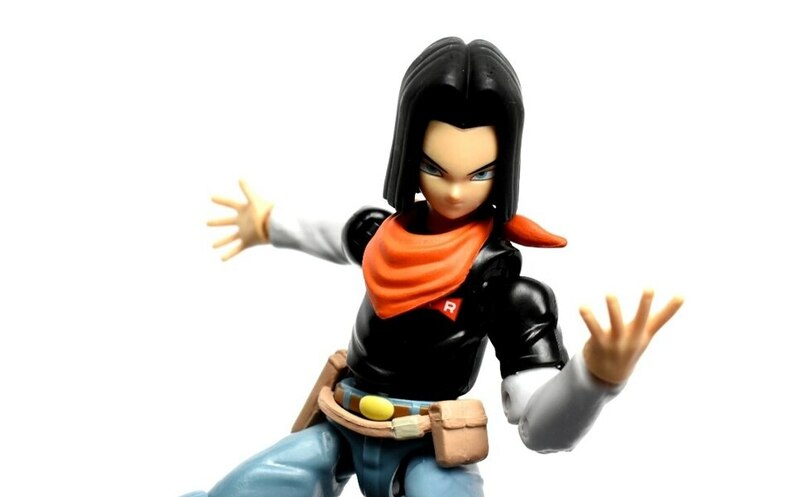 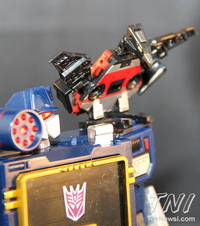 Check out hi-res images (and we do mean a lot of them) for this figure in our GALLERY below. 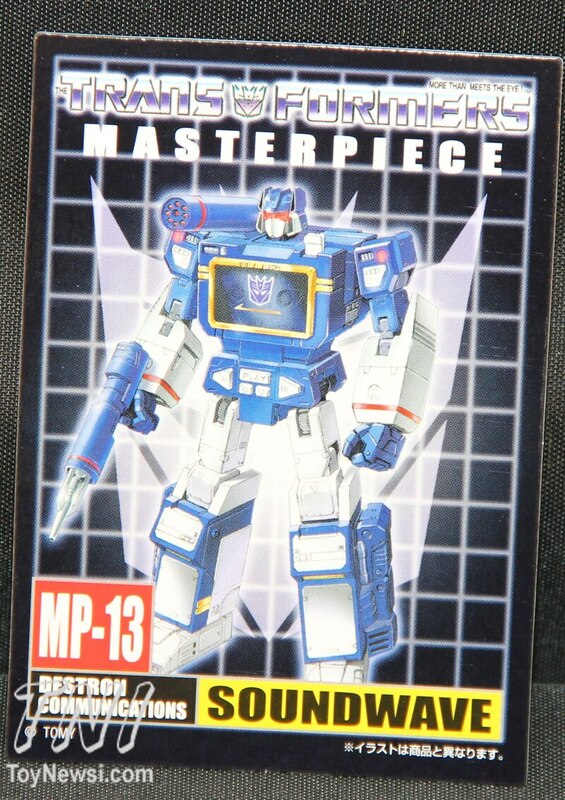 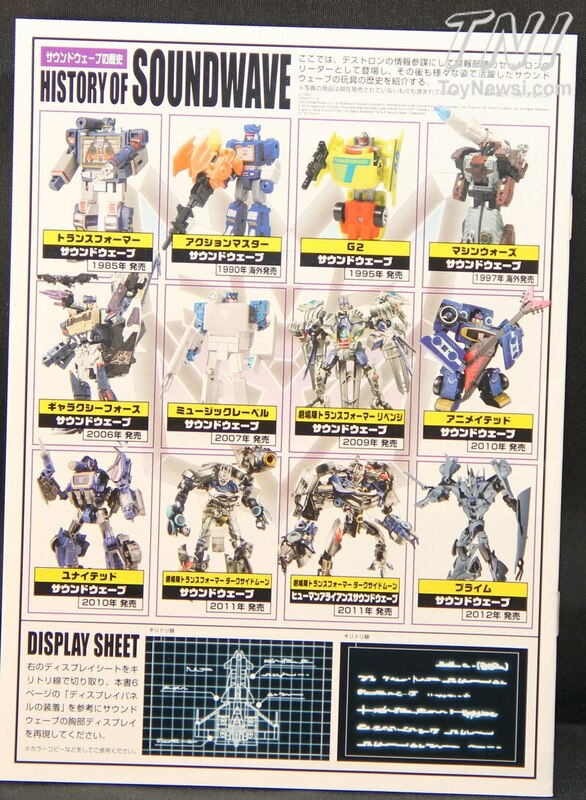 Packaging - The packaging is pretty typical for the Masterpiece line, a rectangle-shaped black box with a big picture of the toy on the front and smaller pictures of the toy showing off its features and accessories with a bunch of writing I can’t read on the back. 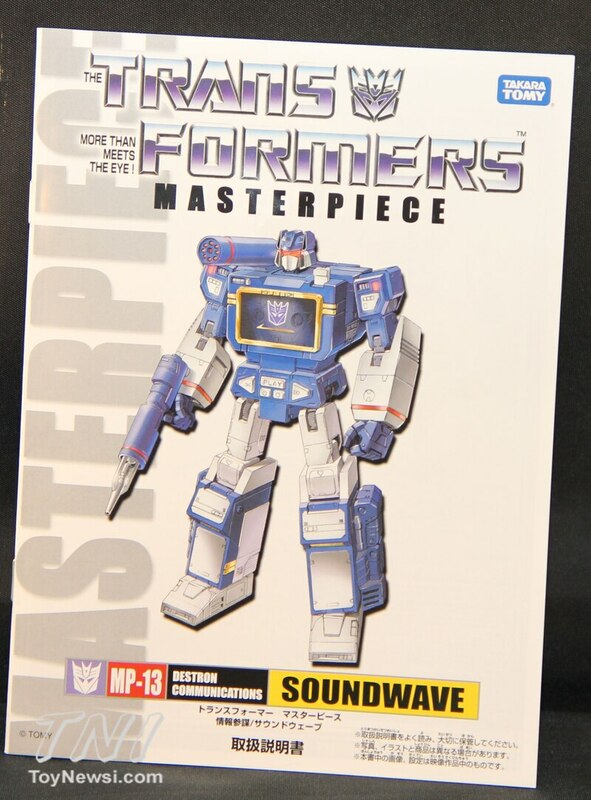 There are bio-cards for both Soundwave and Laserbeak inside as well as an instruction manual with a brief history of Soundwave toys on the back packaged inside the box. 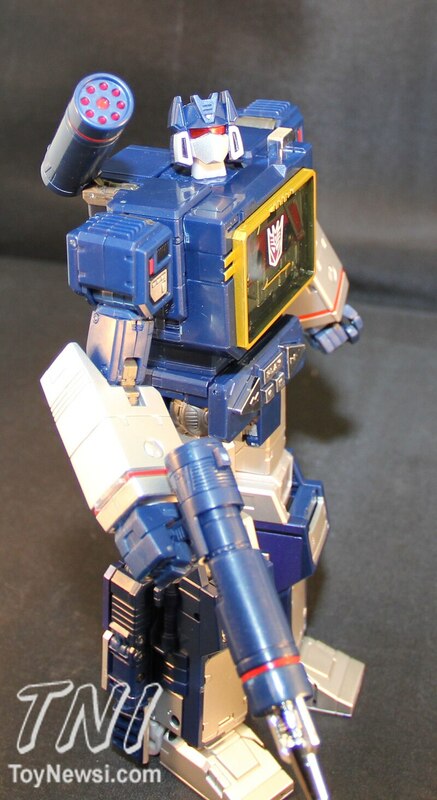 Soundwave - The sculpt on this figure is pretty awesome. 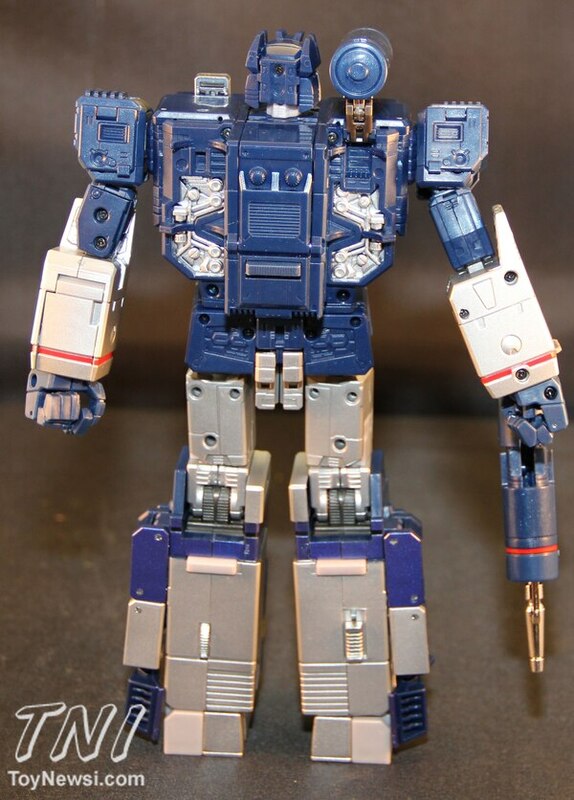 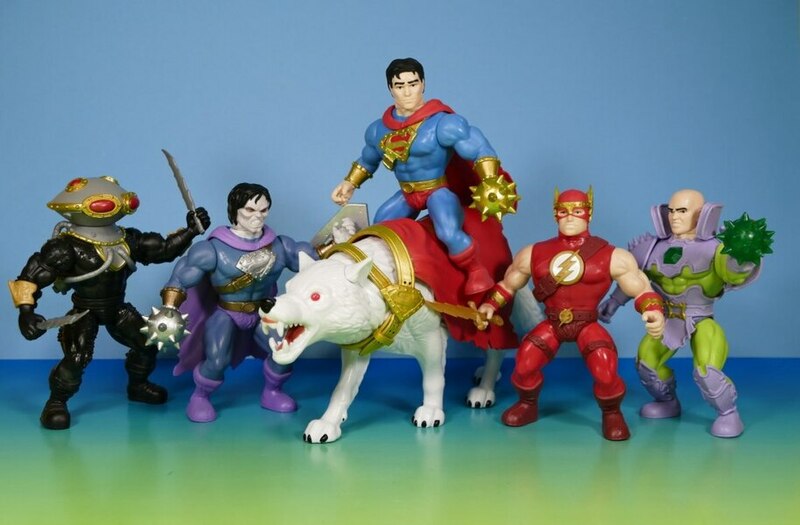 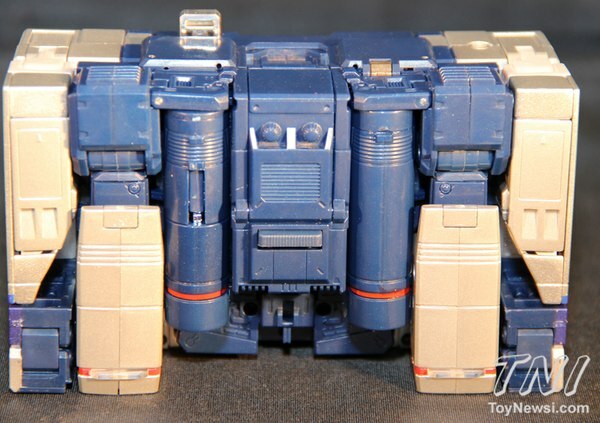 It’s like the toy just stepped out of an old G1 cartoon. 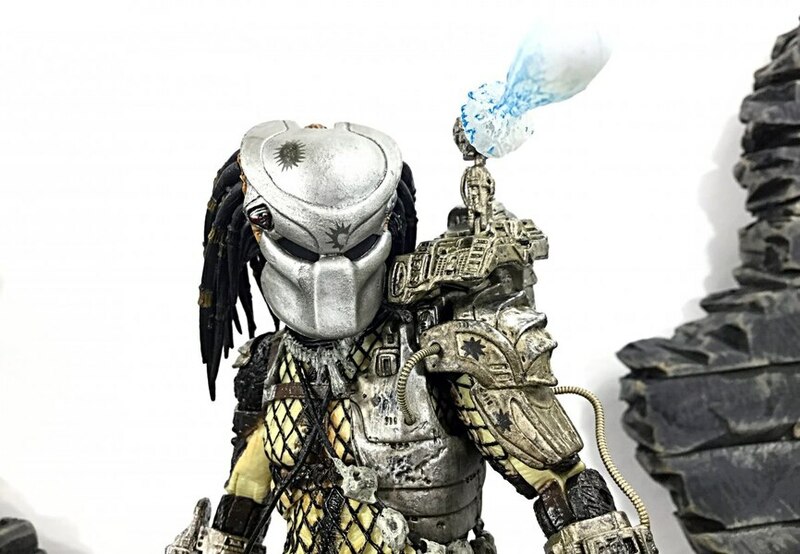 The details are fantastic looking including the working cassette tape buttons on the front and volume control and earphone jacks on the side. 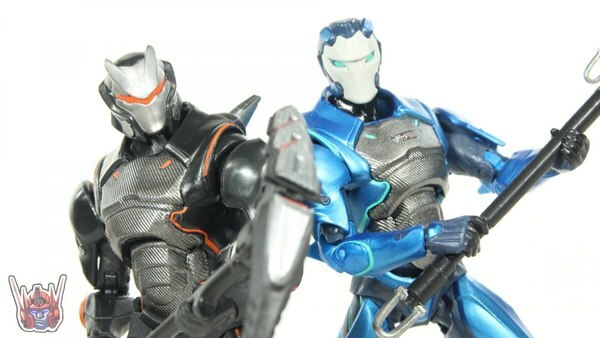 I really love the way the head sculpt looks with the red eyes. 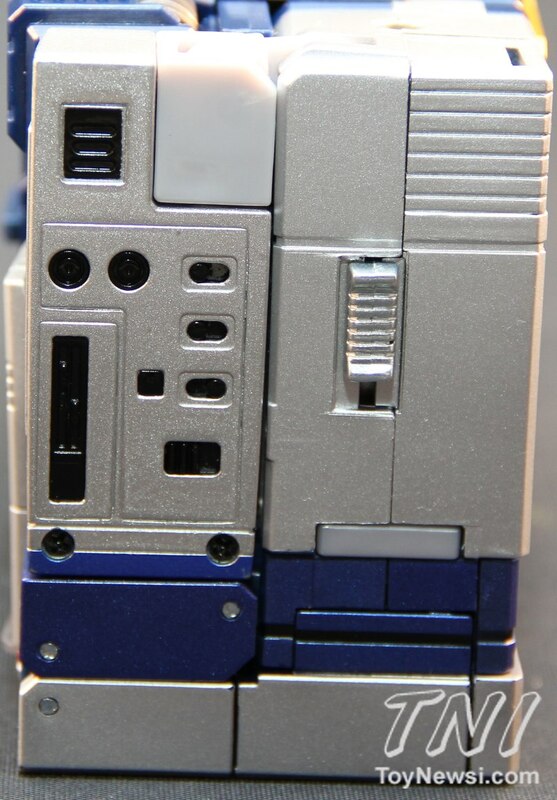 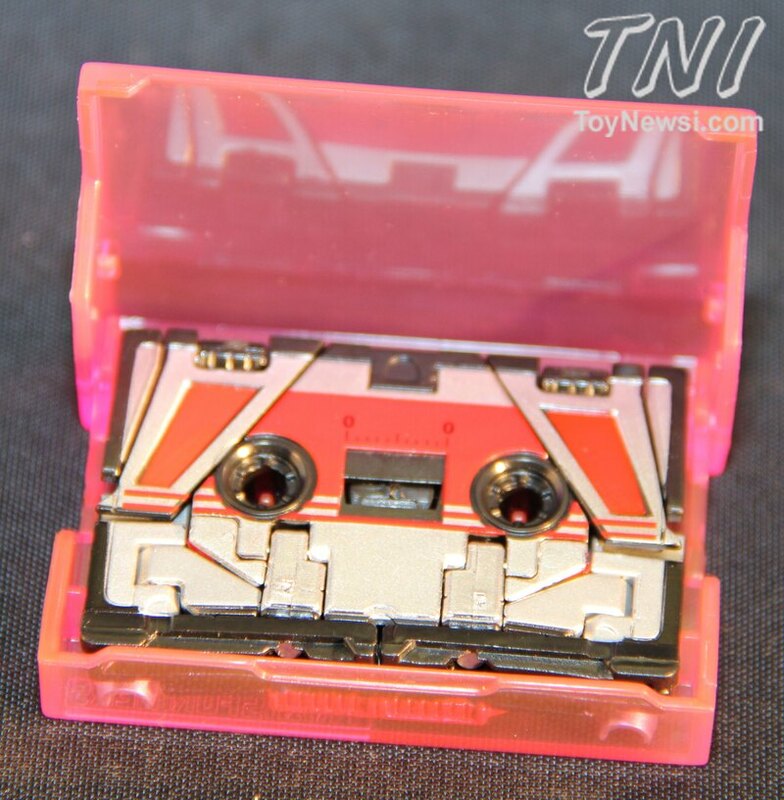 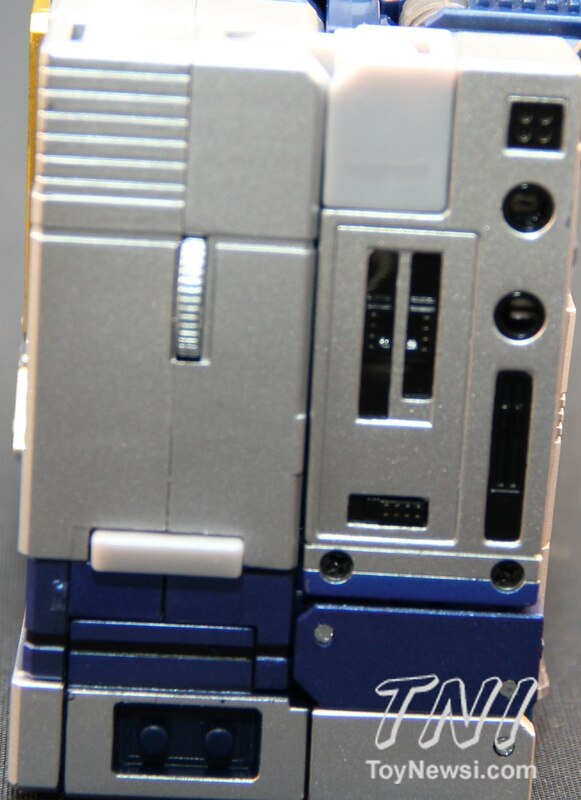 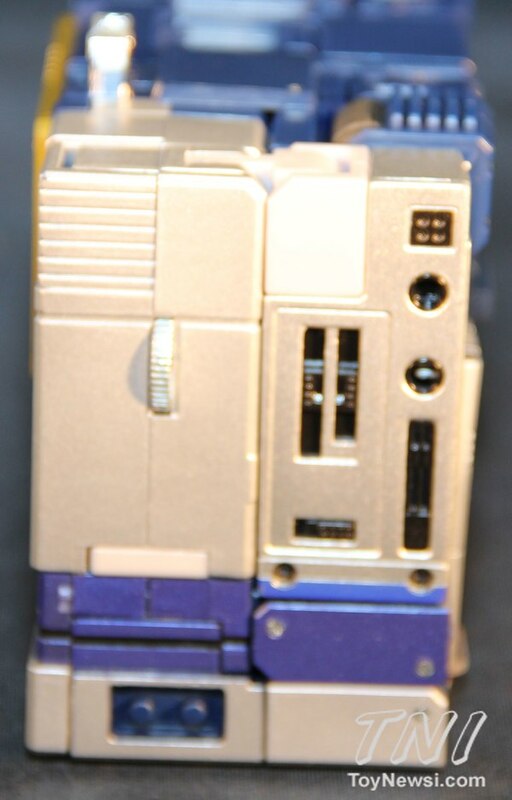 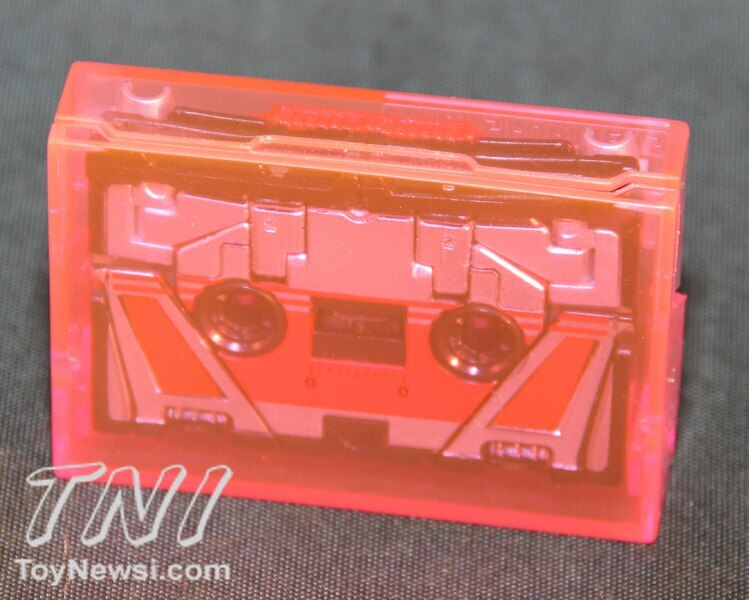 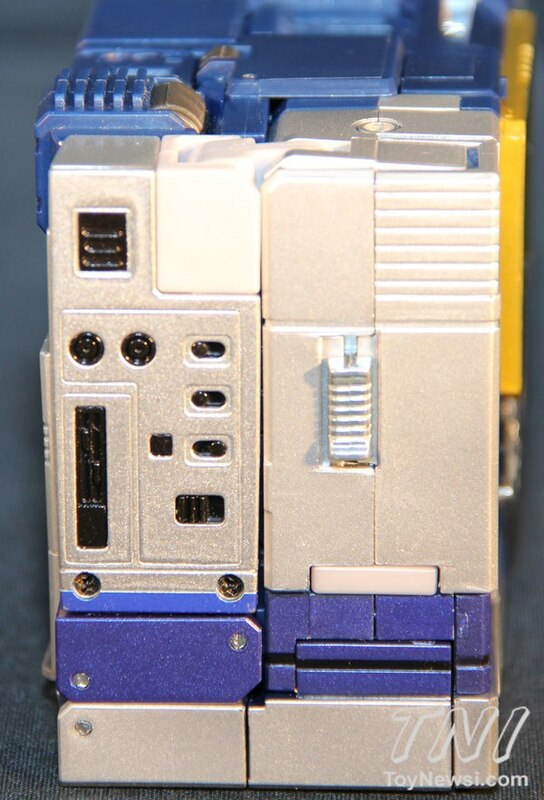 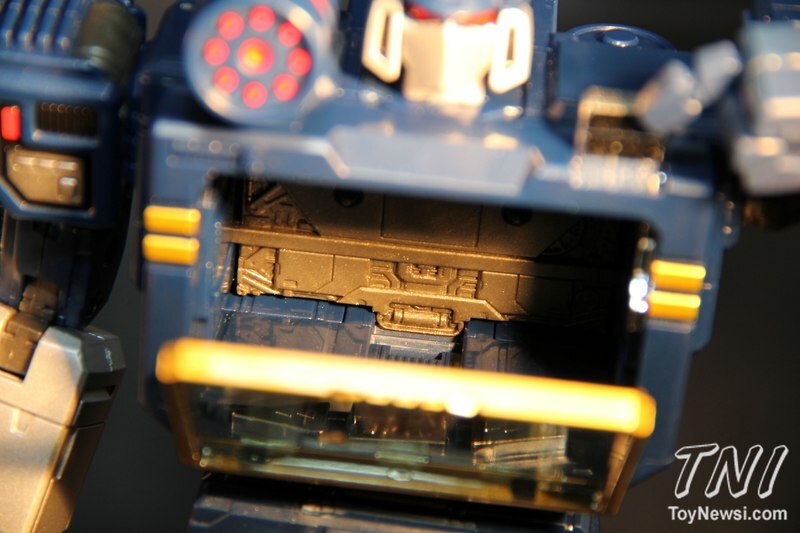 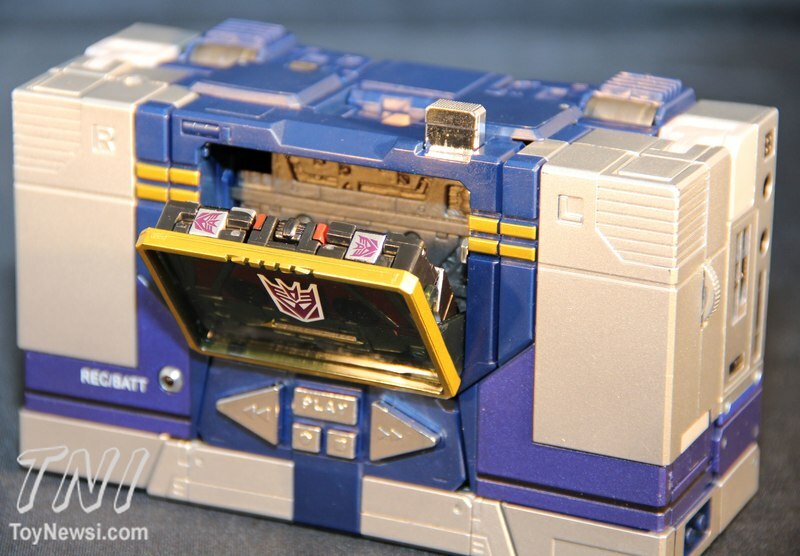 He even has some nice detailing in the cassette chamber that looks like an actual cassette deck. 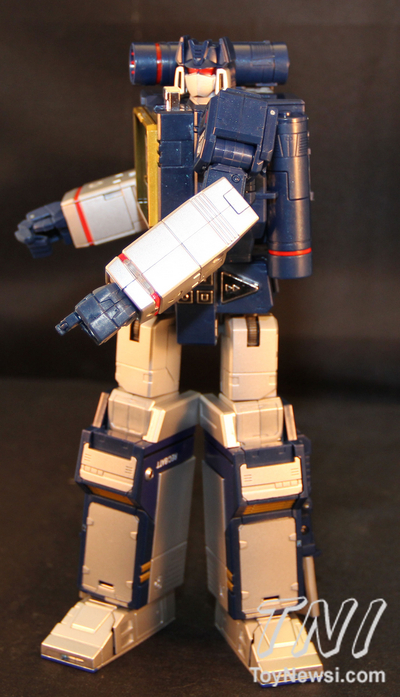 He is in scale with all the other MP’s except for Megatron and MP-01 Optimus Prime. 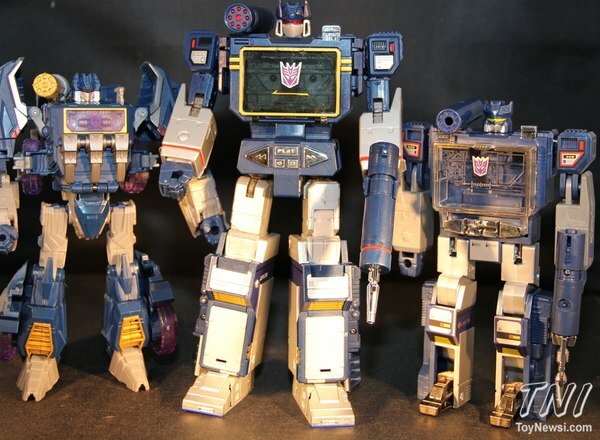 Those two are significantly taller. 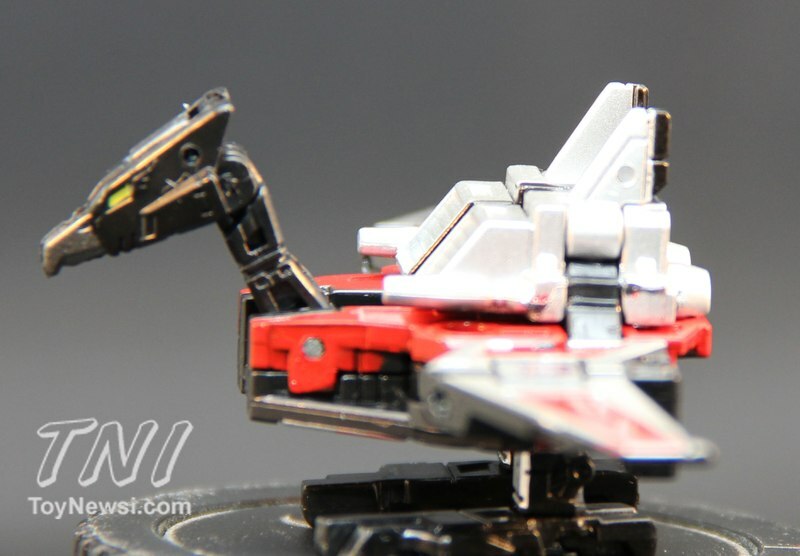 Laserbeak - I love the new Laserbeak and how they made his laser cannons a part of the actual figure so you don’t have to take them off and store them someplace in cassette mode. 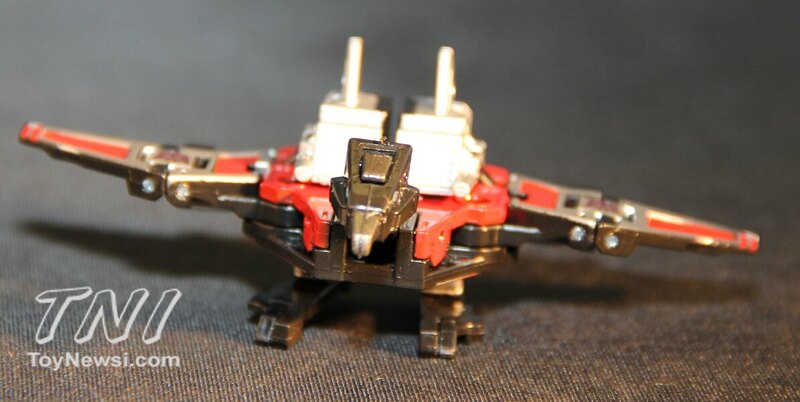 I do wish the actual cannons were a little longer but then they could not be concealed in cassette mode so I am not bothered too much. The headsculpt is very reminiscent of the original toy, and they even put a little pop-up video camera on its head so he can spy on unsuspecting Autobots. 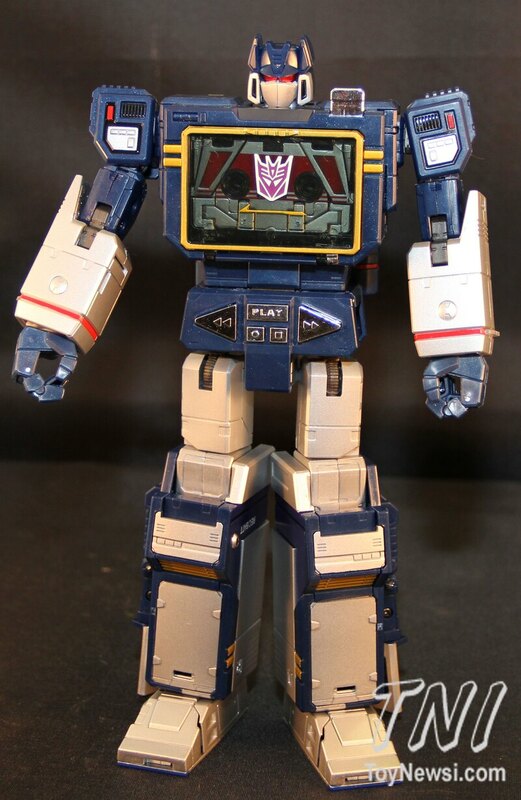 Soundwave - The paint apps for this figure incorporate the traditional blues and grays just like on the original toy.The buttons on the front along with the eject, volume and power are chrome-plated like the original toy. The eyes also have a red metallic-type paint that shines in the light. I like the red on the eyes better than the yellow the original Soundwave toy had. 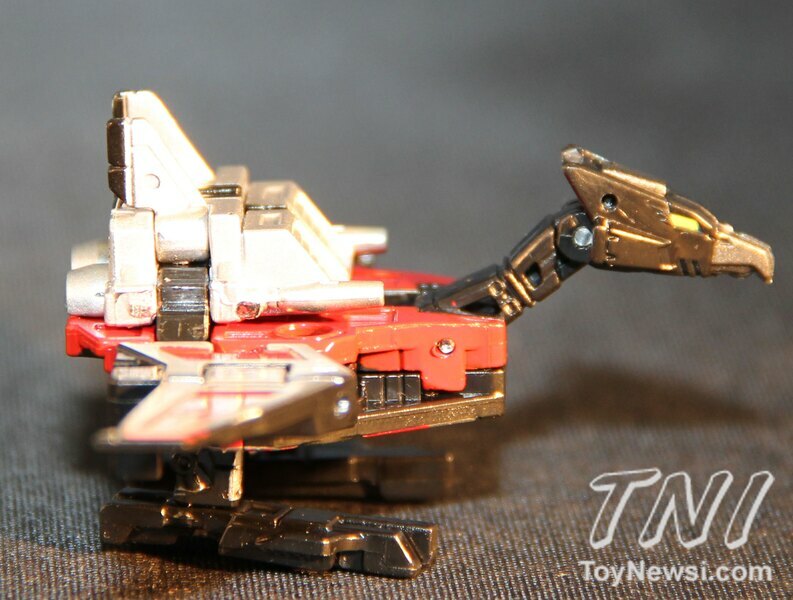 Along with the blues and grays, some gold and red trimming is mixed in and they’ve painted the missiles on his shoulder cannon red so they stand out more. 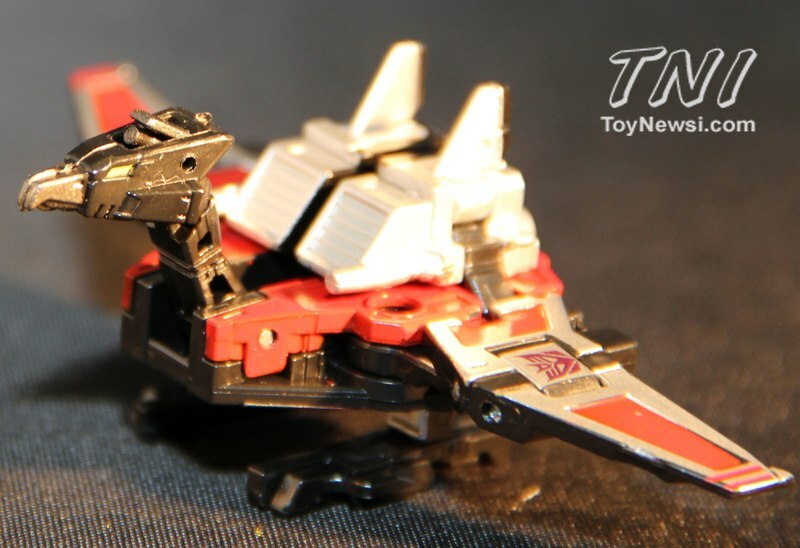 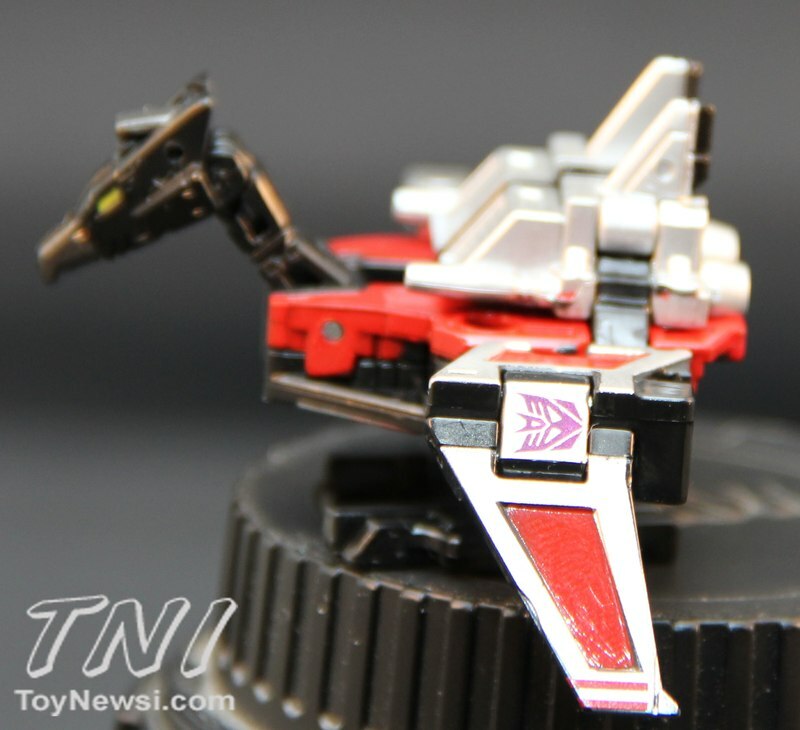 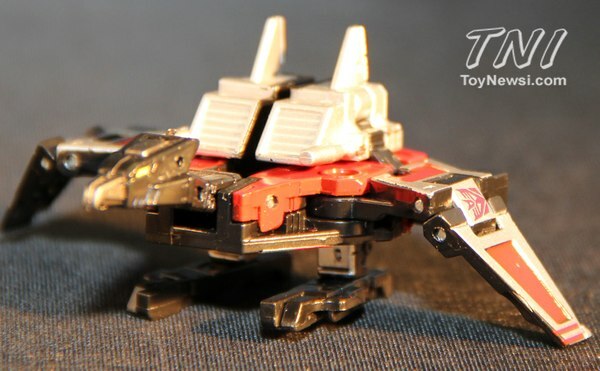 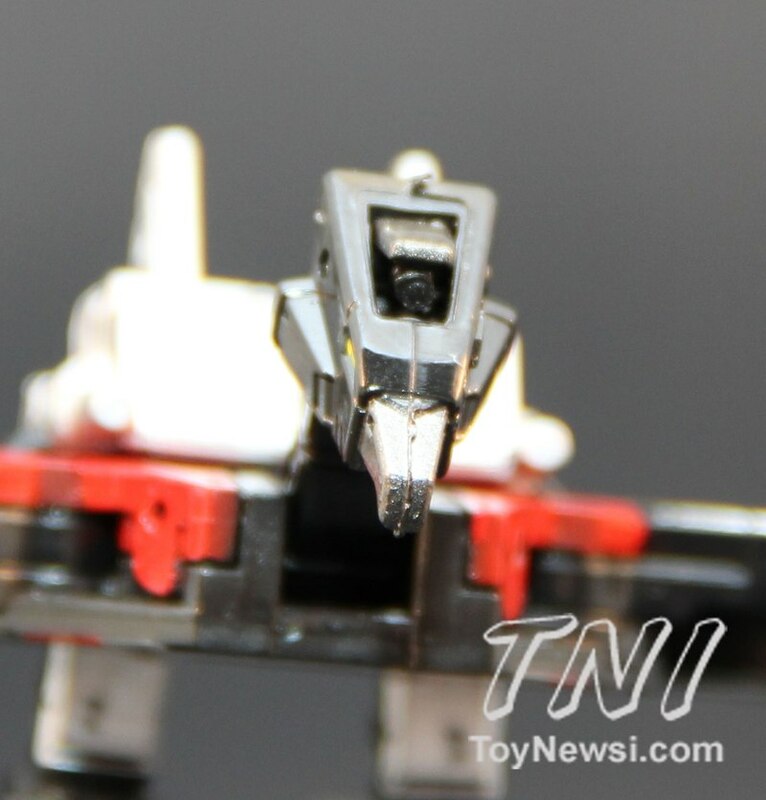 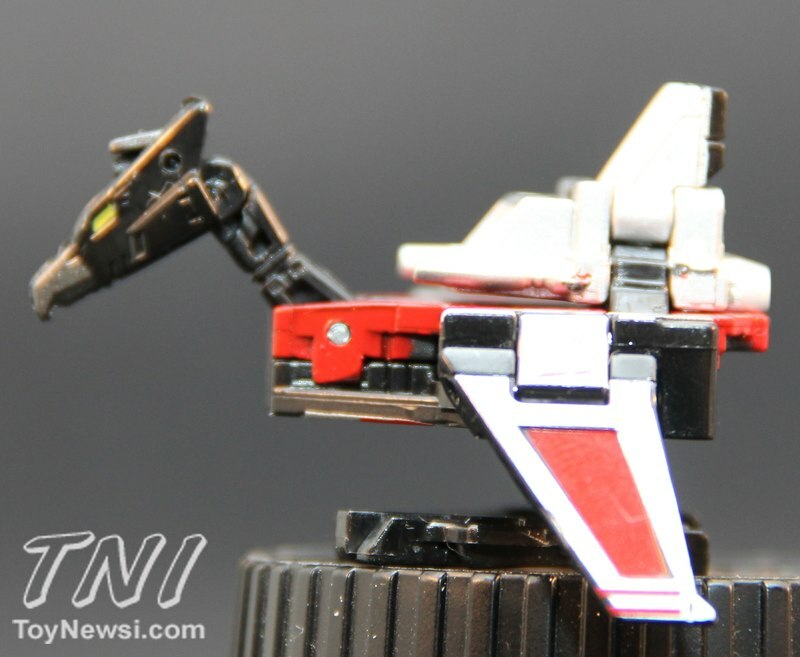 Laserbeak - The figure incorporates the character’s traditional colors of red and black with some gold washes used on the beak, eyes and camera on the top of the head so they stand out a bit. 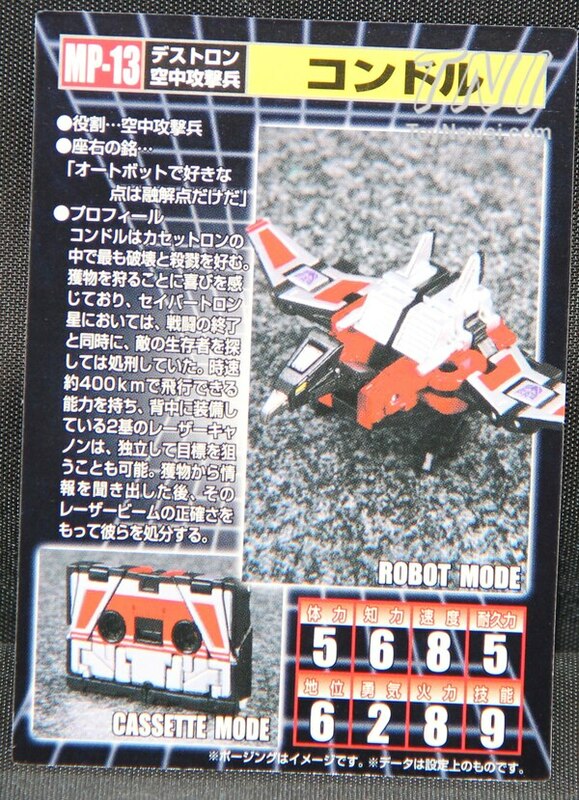 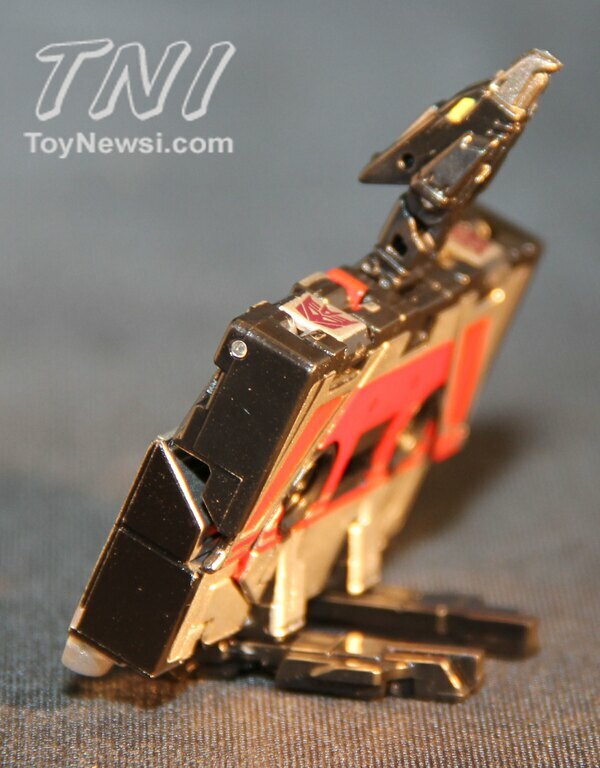 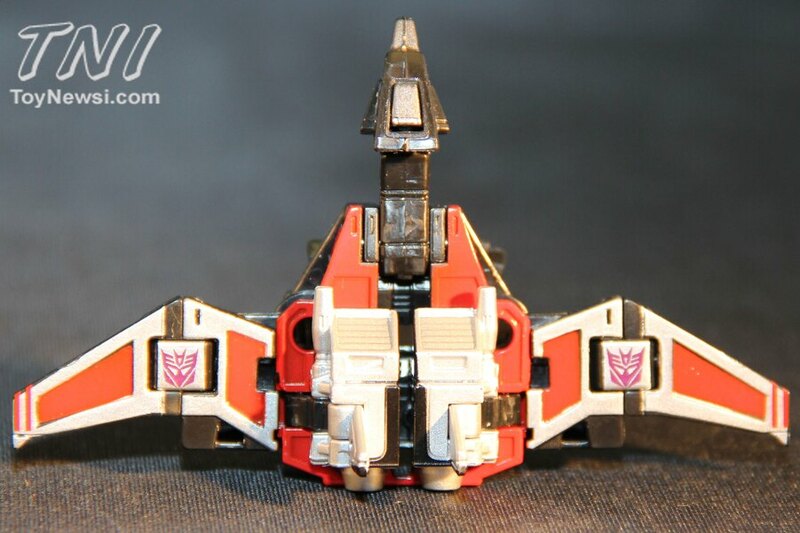 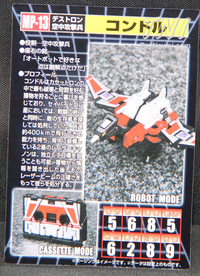 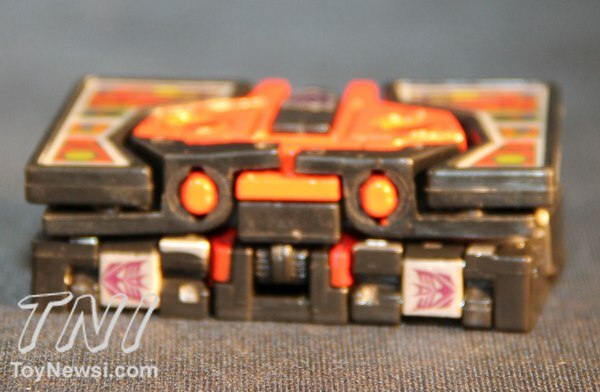 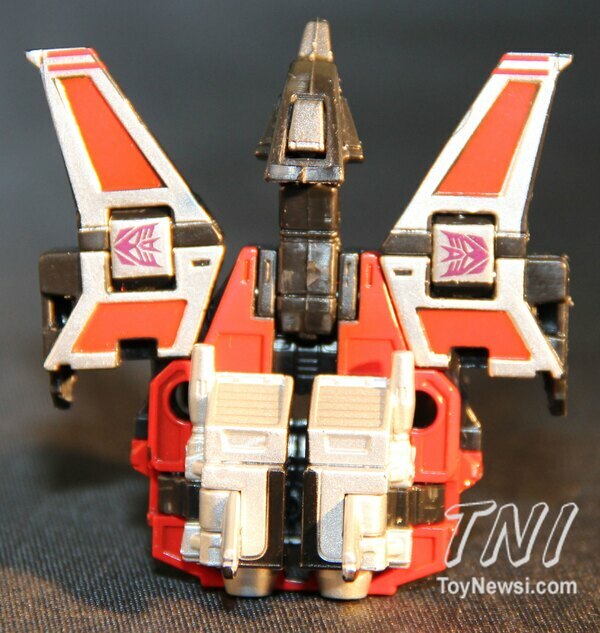 The bottom of the figure is made to look like a cassette tape and the wings have Decepticon logos painted on them. 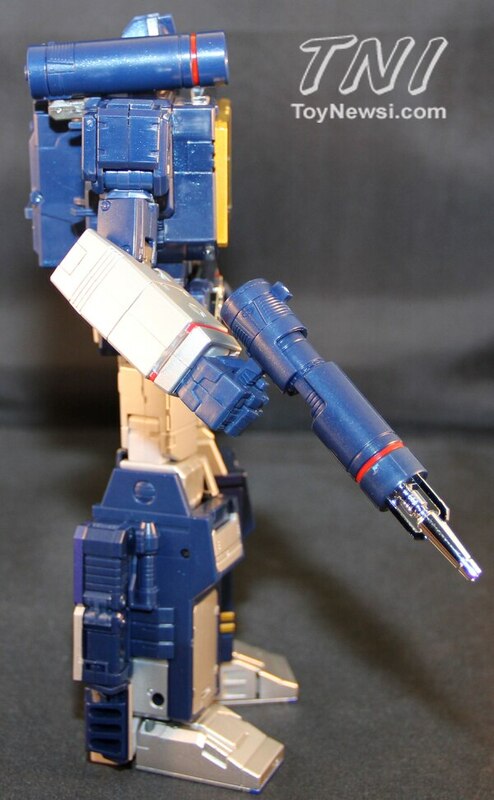 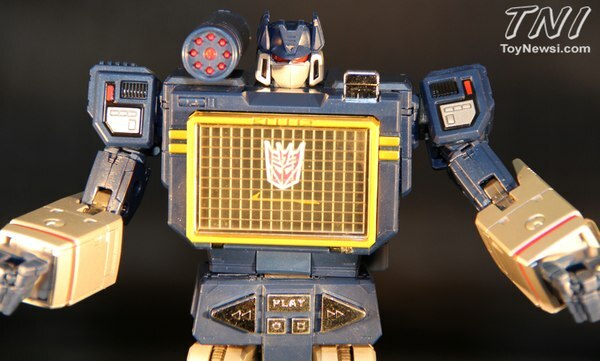 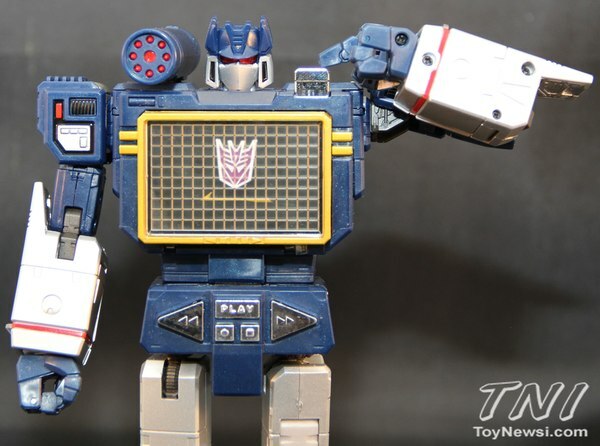 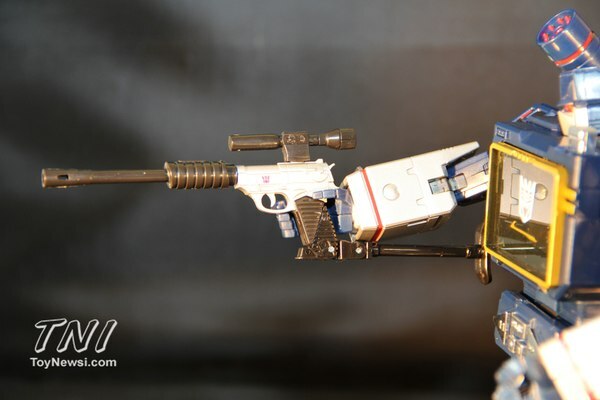 Soundwave - This figure has a great range of motion for a Transformer. The Head swivels all the way around in a 360 motion, and he can look up but not down. 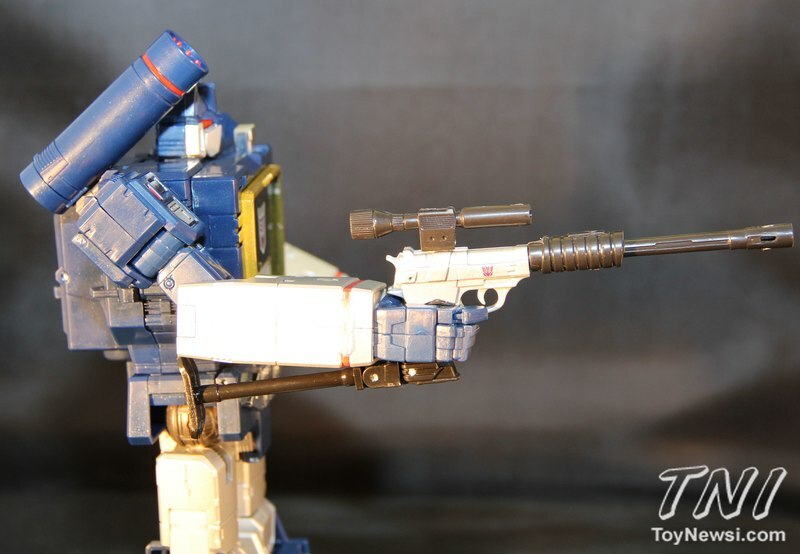 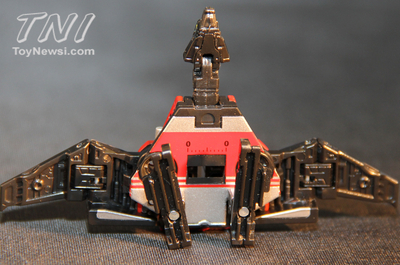 His shoulder cannon is hinged to his back and can swivel around in multiple directions. 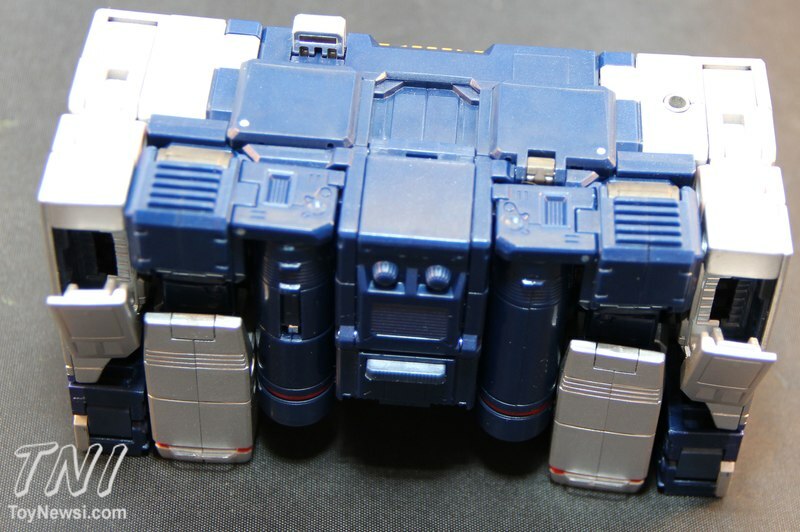 It does not detach like on the original, it folds around and attaches to his back if you don’t want it to be seen. He has hinges in his shoulders that rotate, swivel bicep joints, double hinged elbows, and swivel wrists. 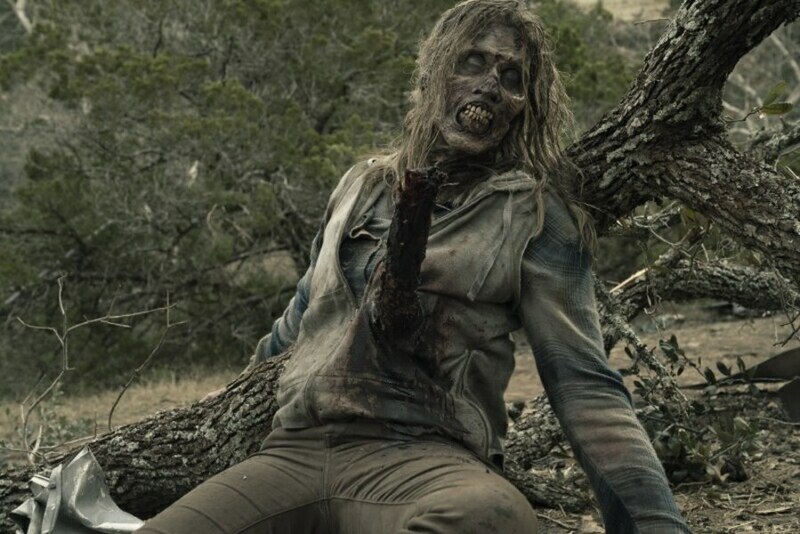 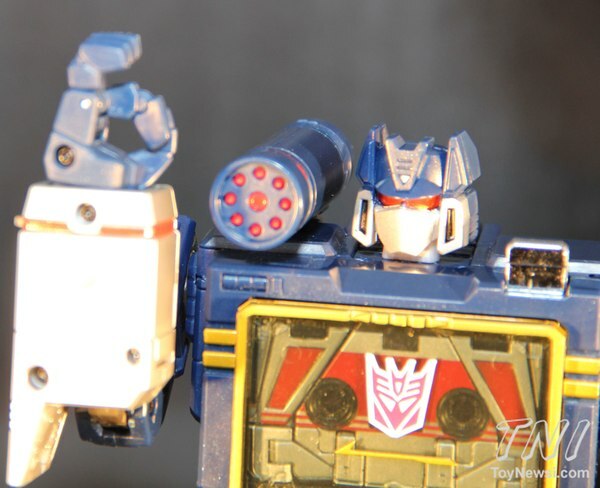 For his hands he has the bottom three fingers attached as one piece with the top finger and thumb separate from each other so he can hold his weapons pretty well. 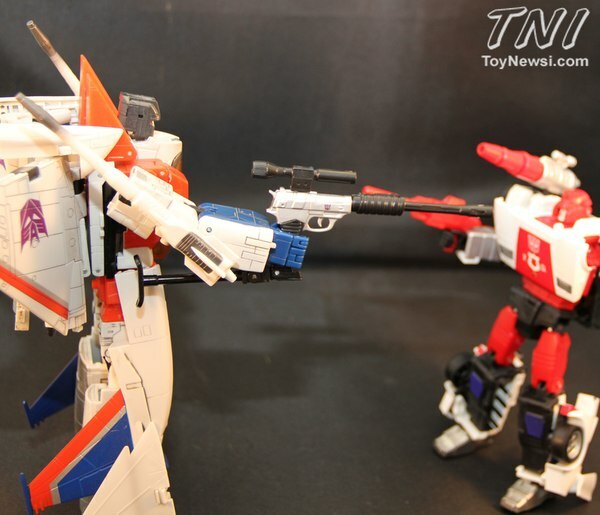 He also can bend his arm enough that he can actually reach and press his own eject button which is cool. He has a swivel waist. His legs don’t go very far back at the waist but the legs can swivel outwards to the side. He has swivel joints at the thigh and working knees. He even has ankle rocker type joints. 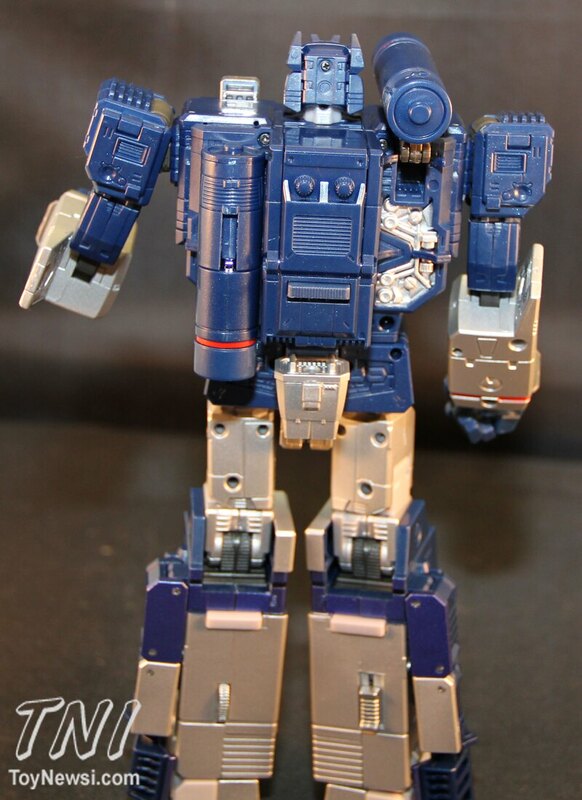 This is more of a transformation thing but it still allows him to have ankle tilts. 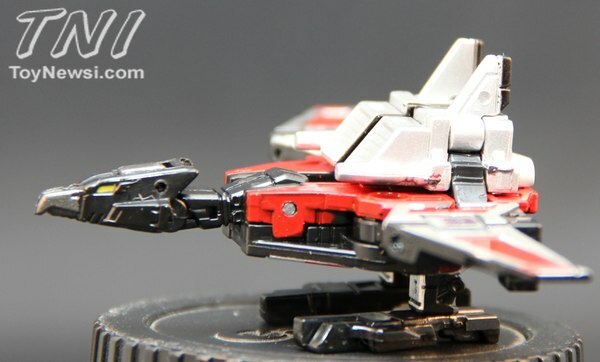 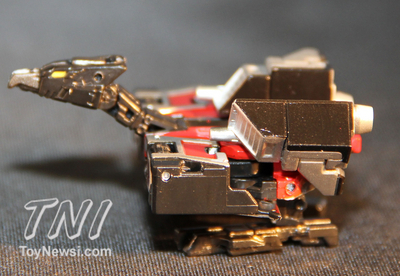 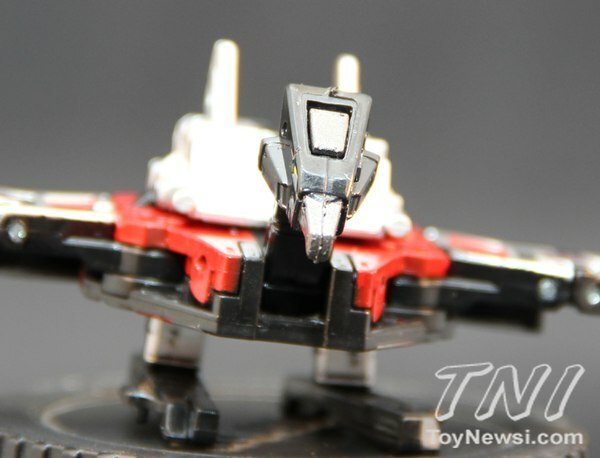 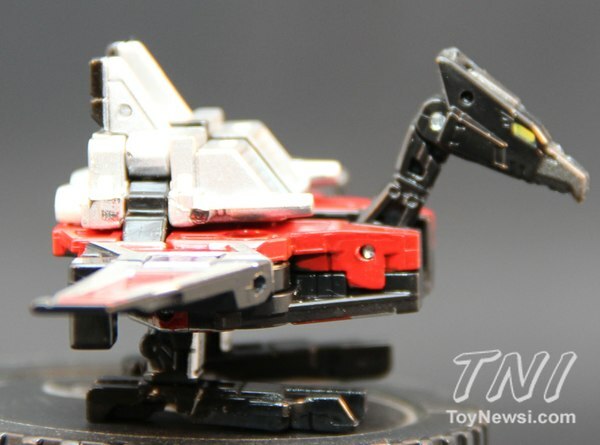 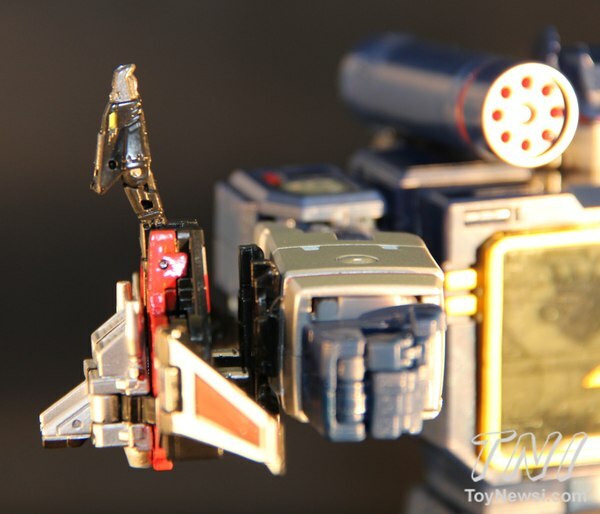 Laserbeak - This figure has more range of motion than the original. 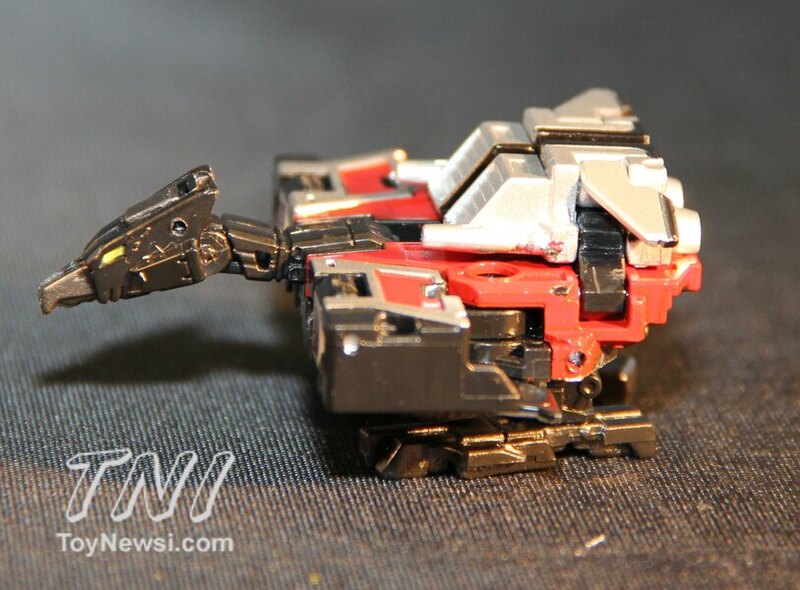 His neck is on a hinge so it can be posed in multiple positions. 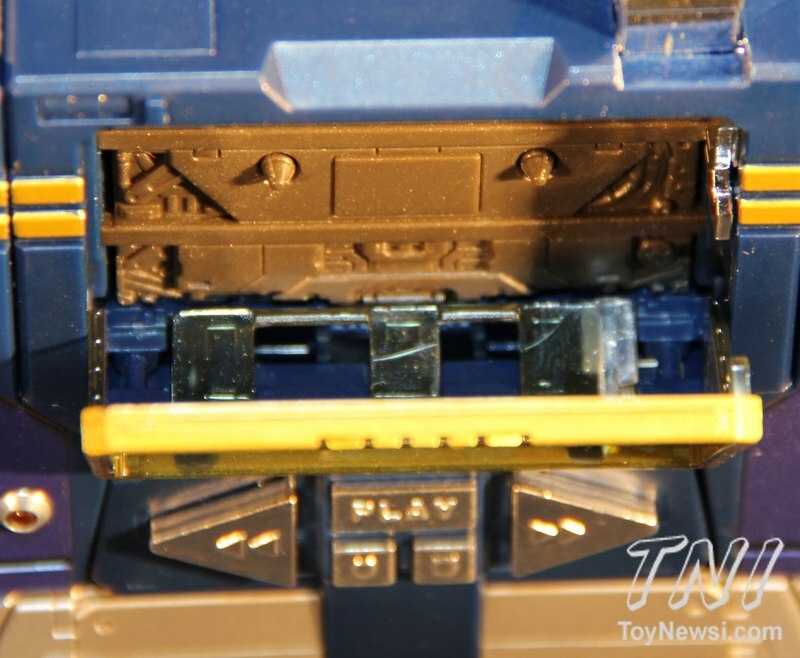 The cannons fold inside the body when in cassette mode so you don’t have to remove them and store them like on the original. 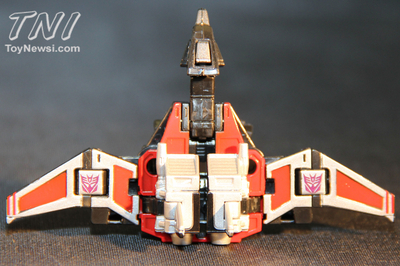 The wings can bend at the mid-way point, and the legs rotate. 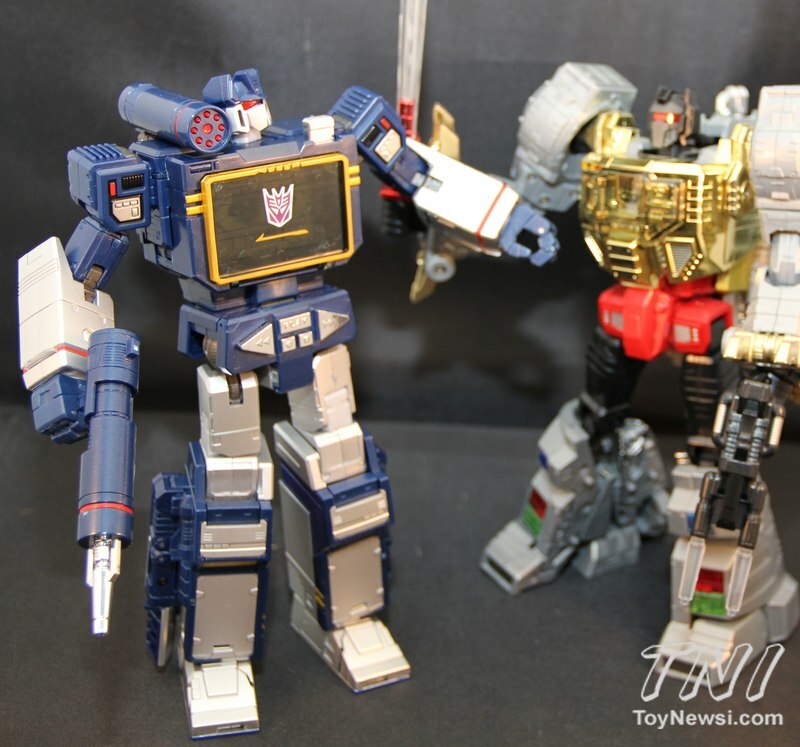 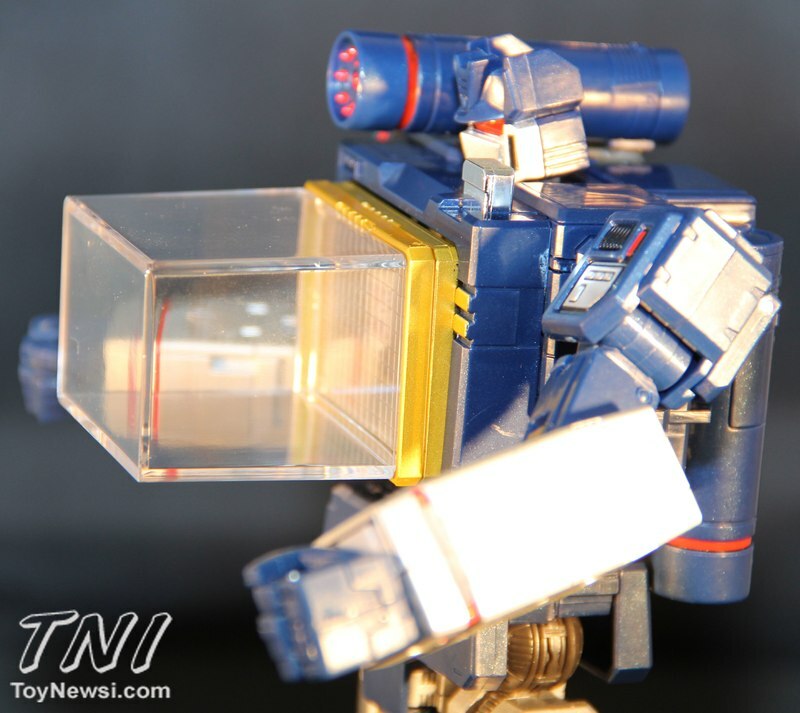 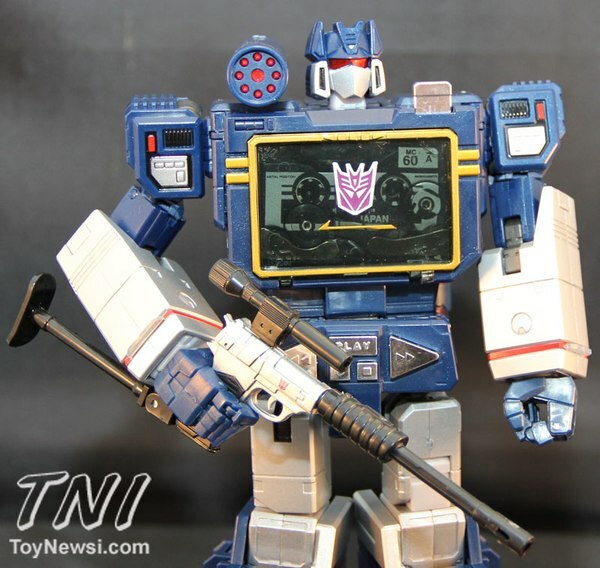 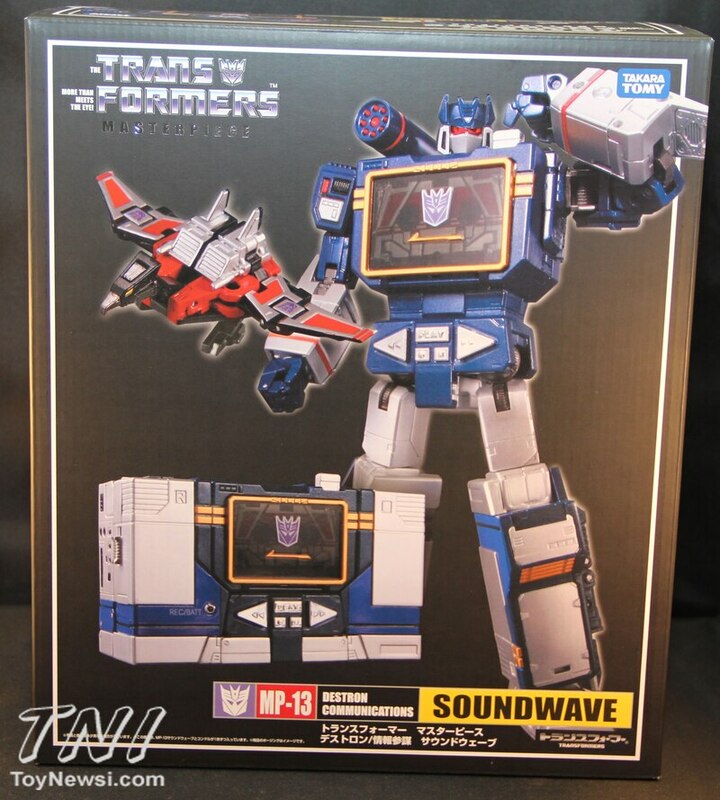 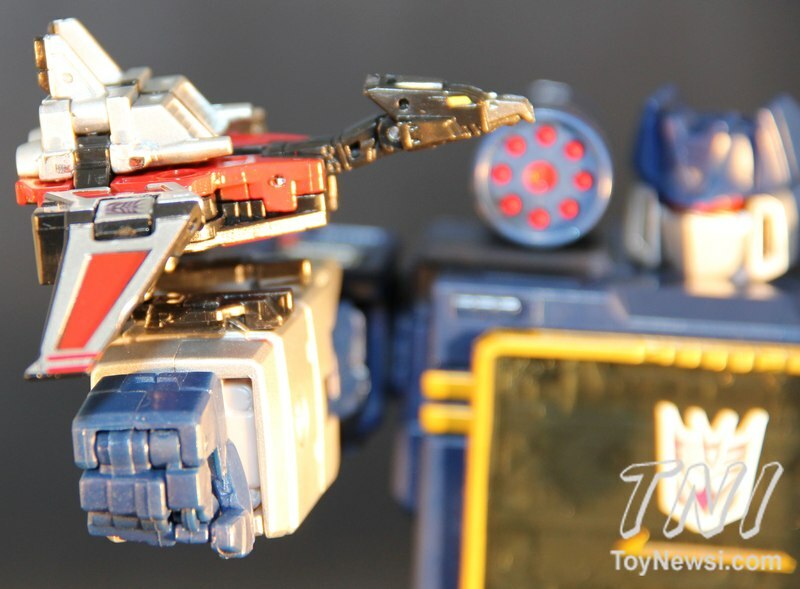 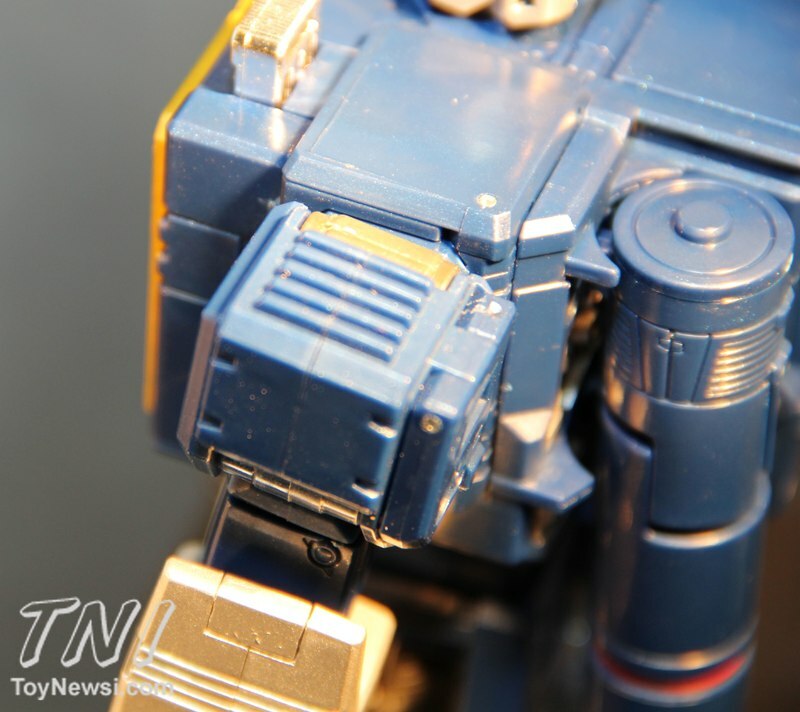 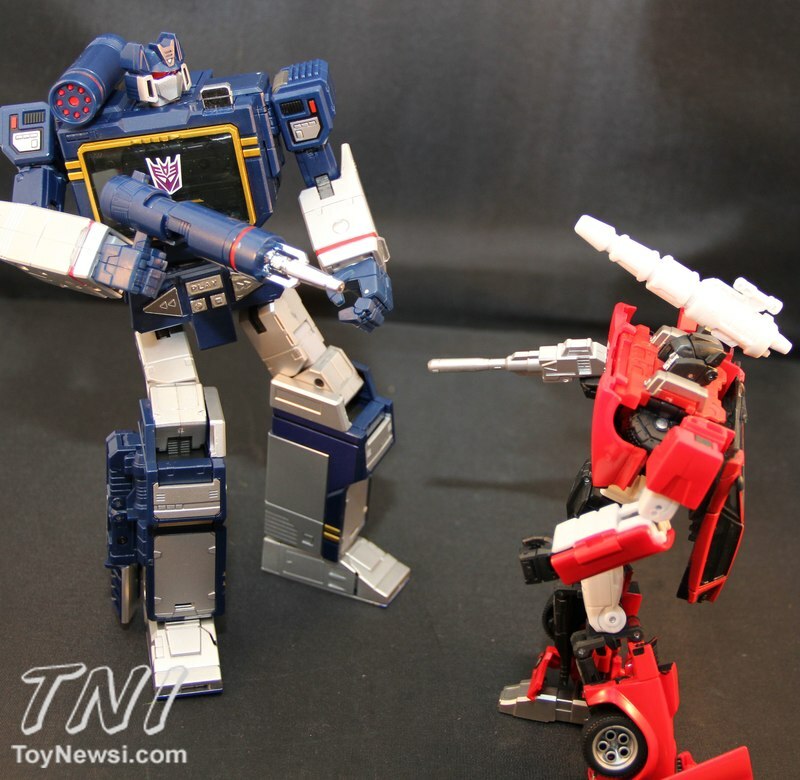 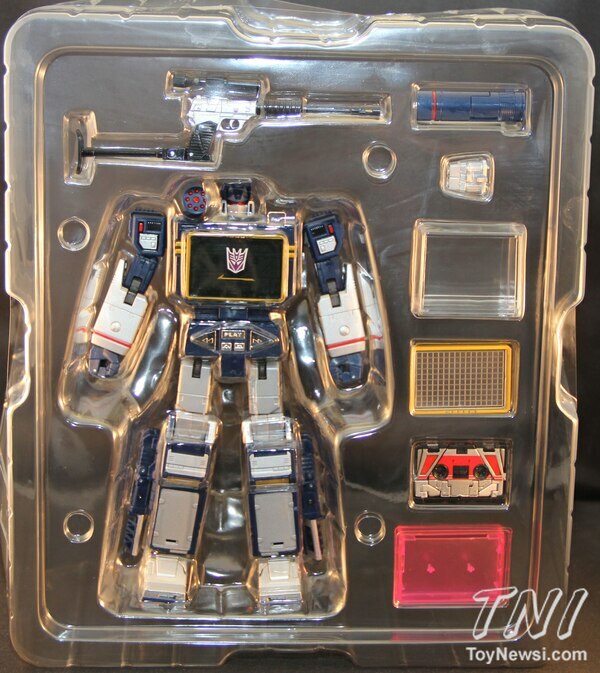 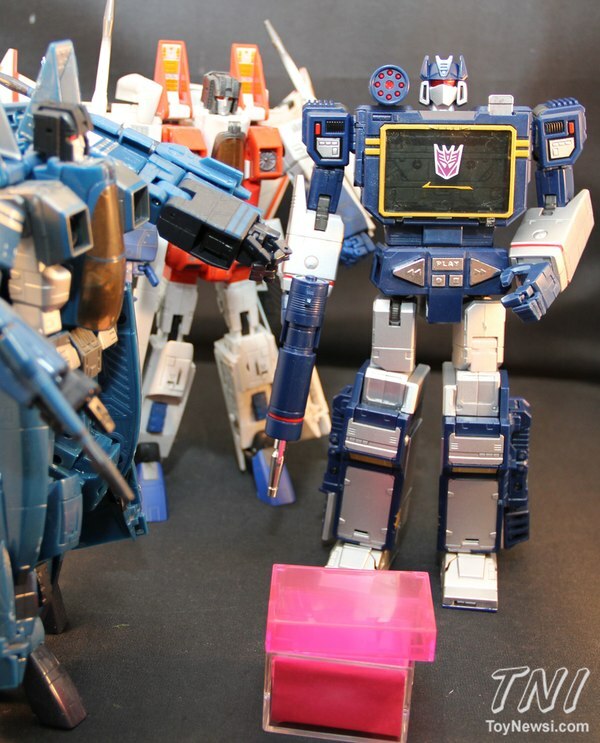 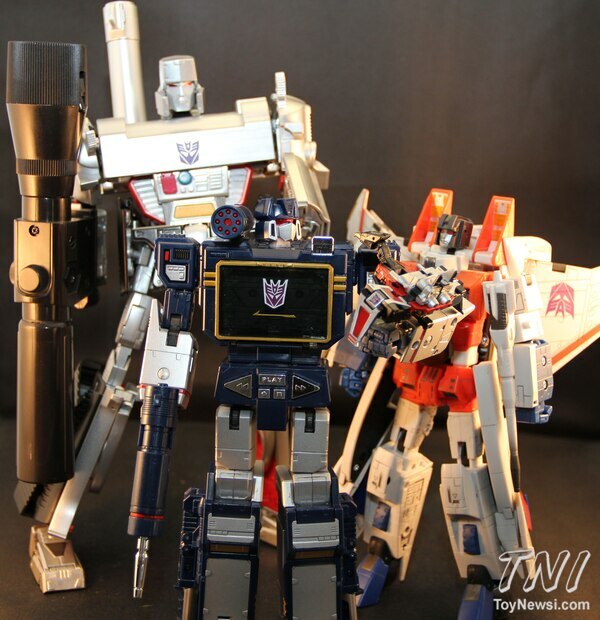 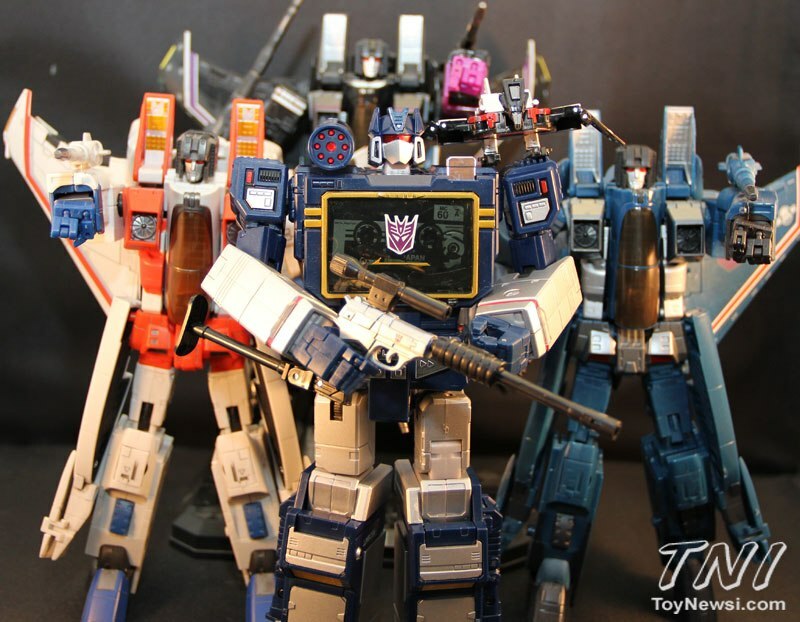 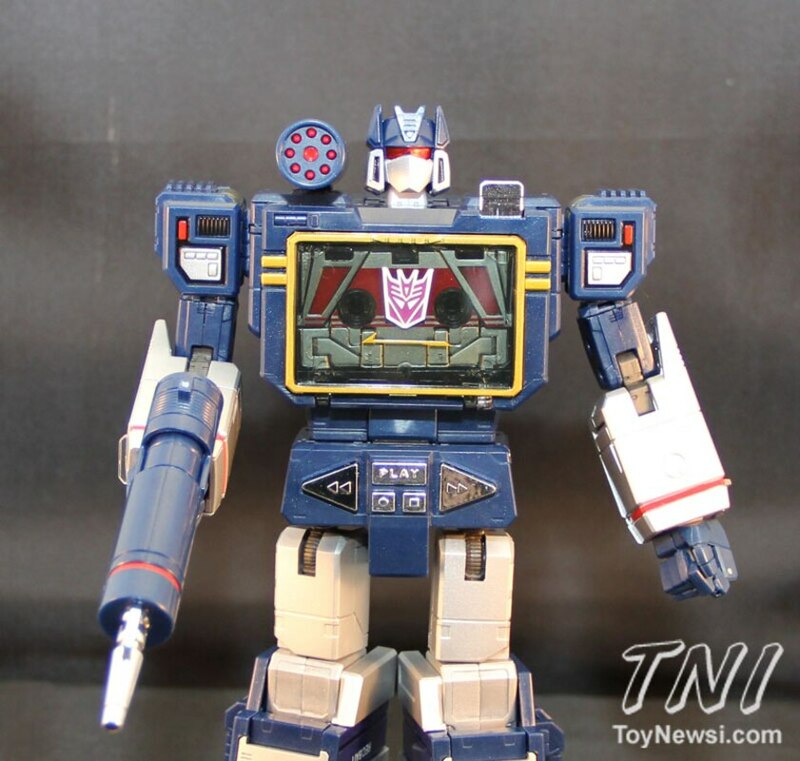 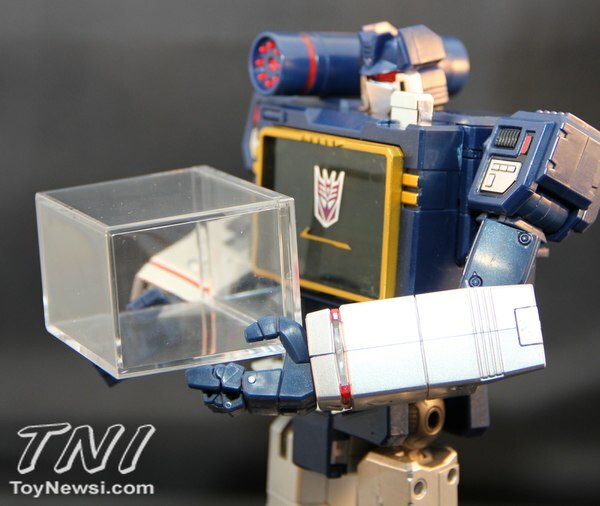 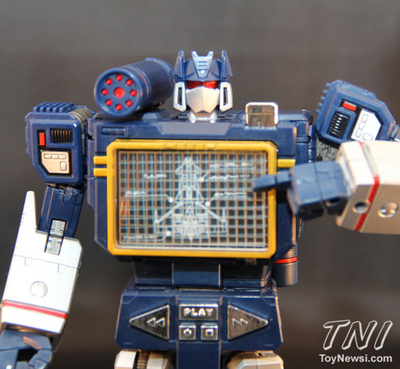 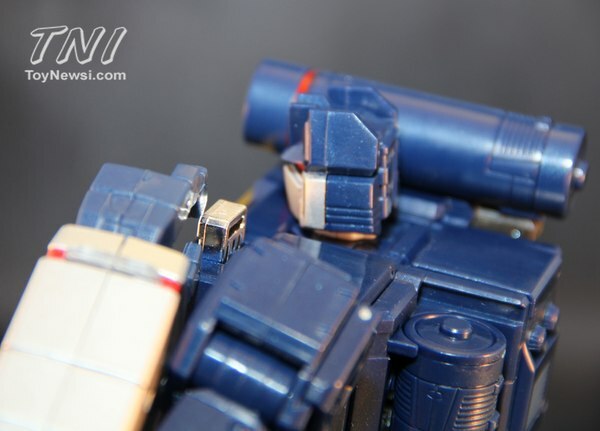 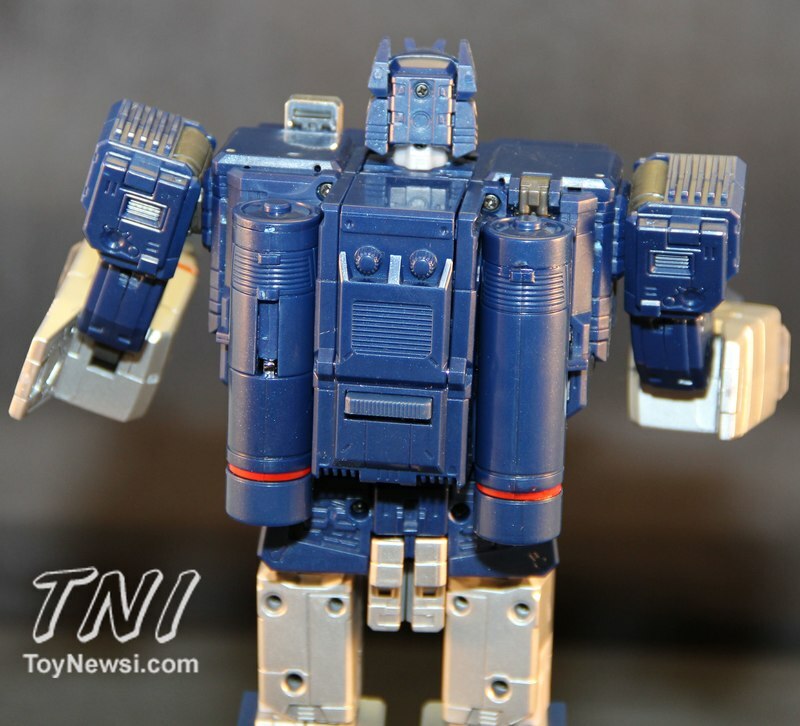 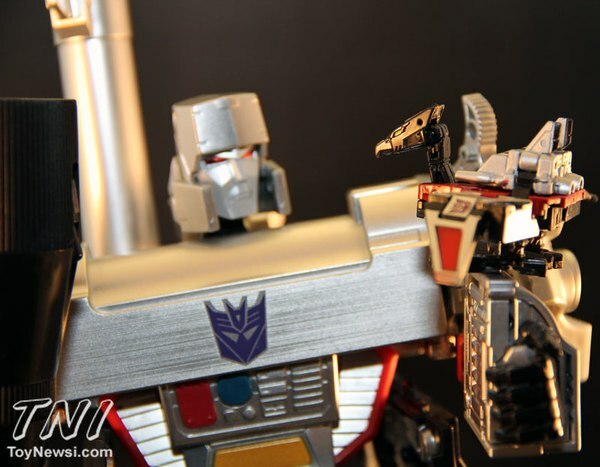 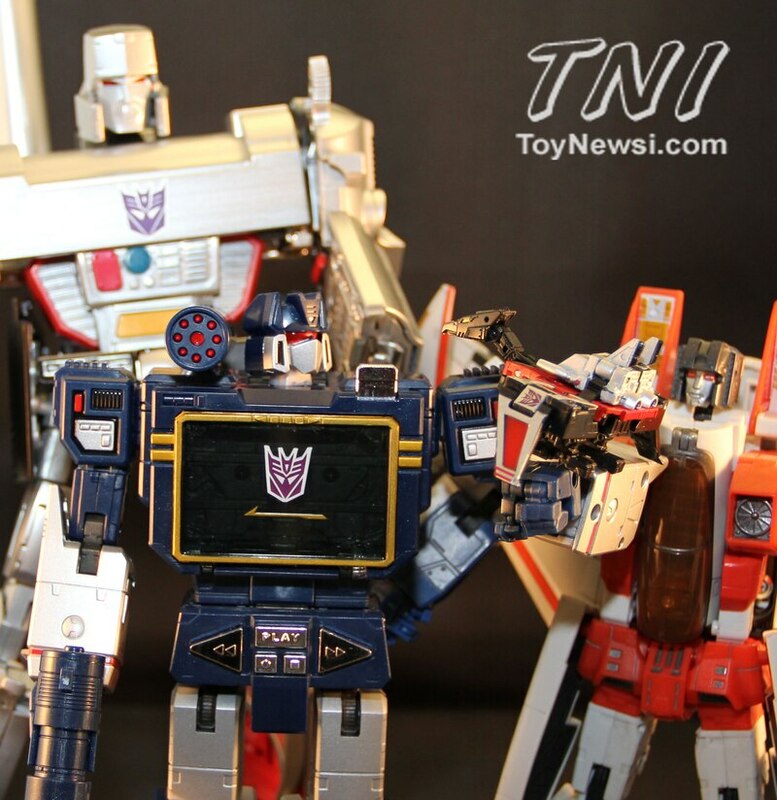 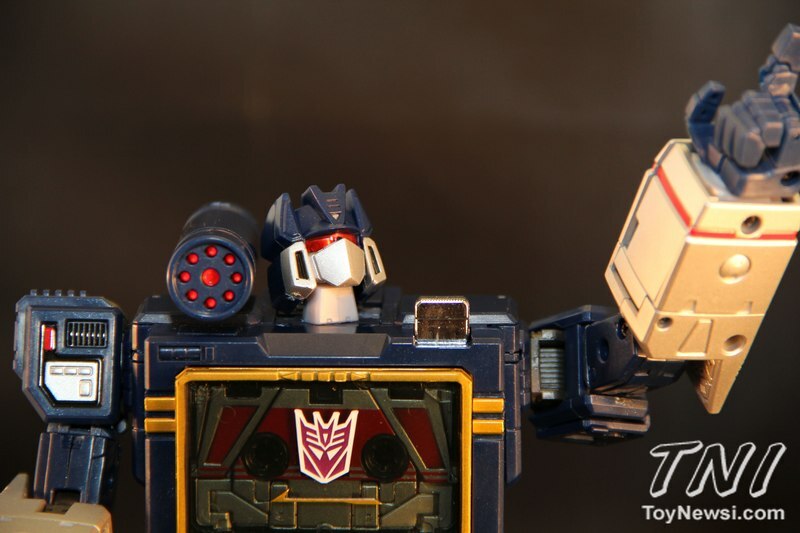 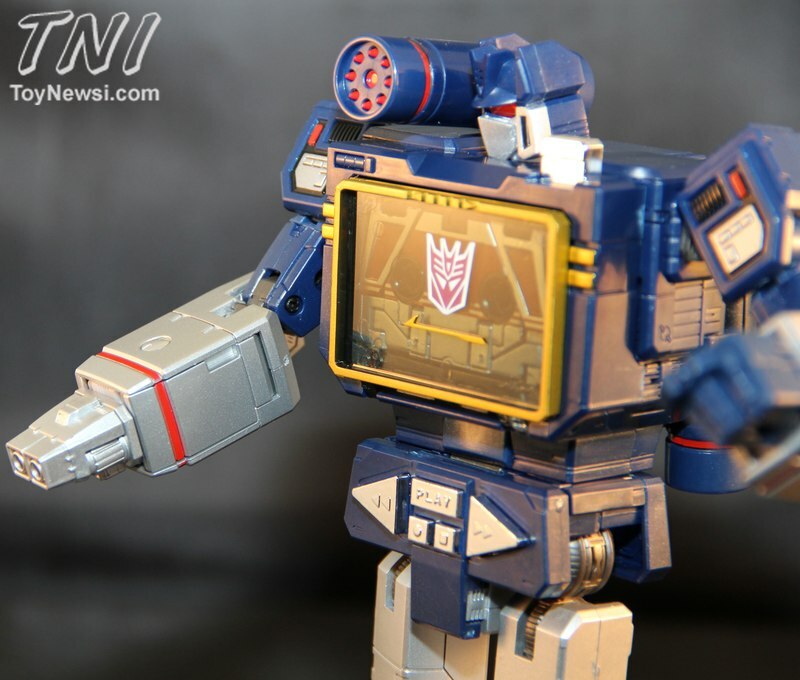 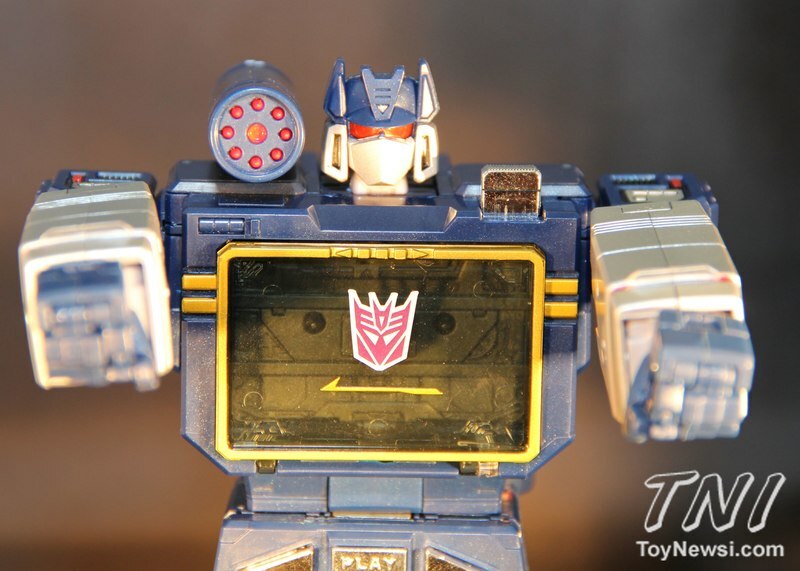 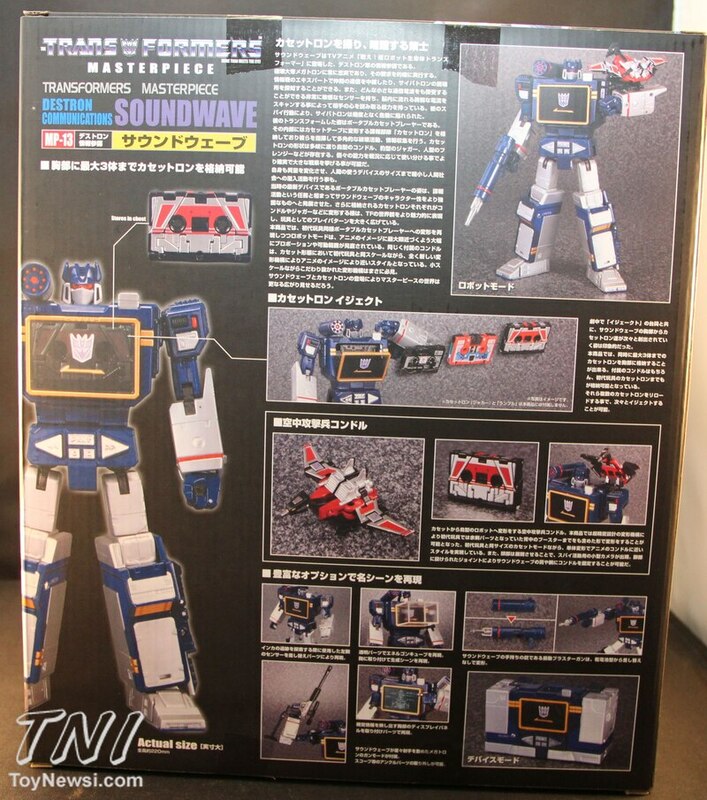 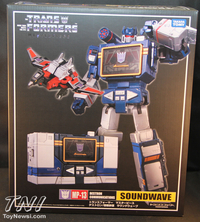 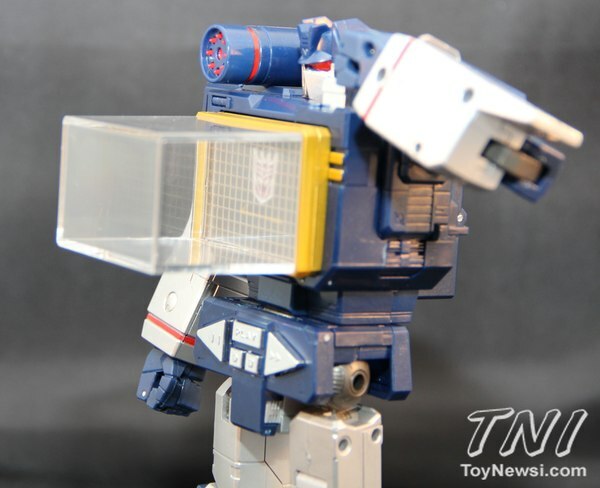 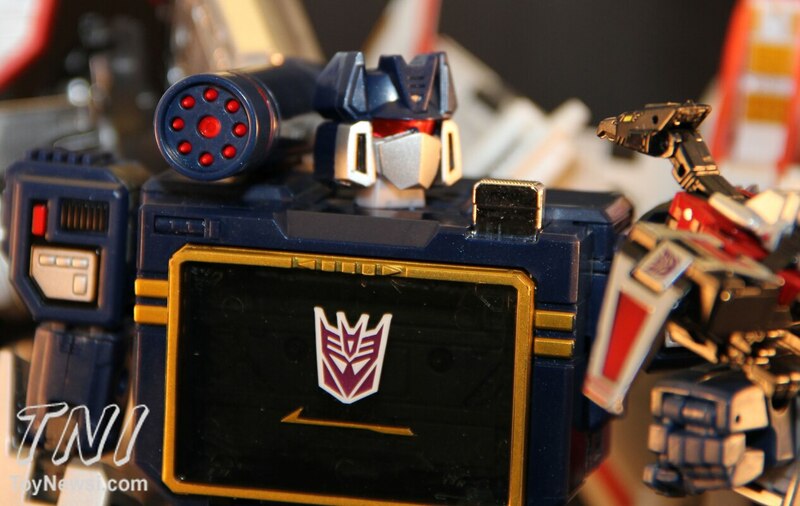 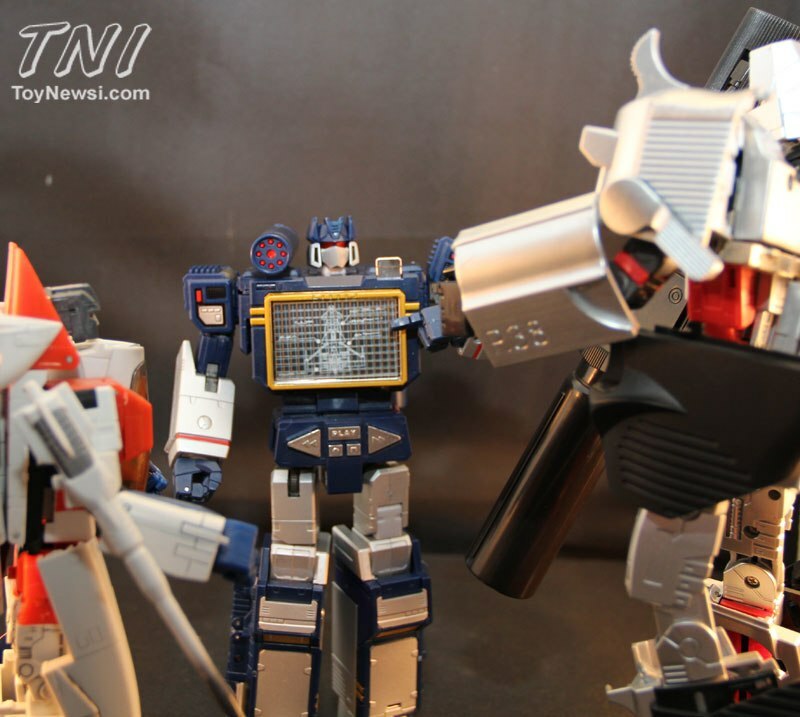 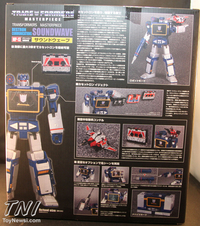 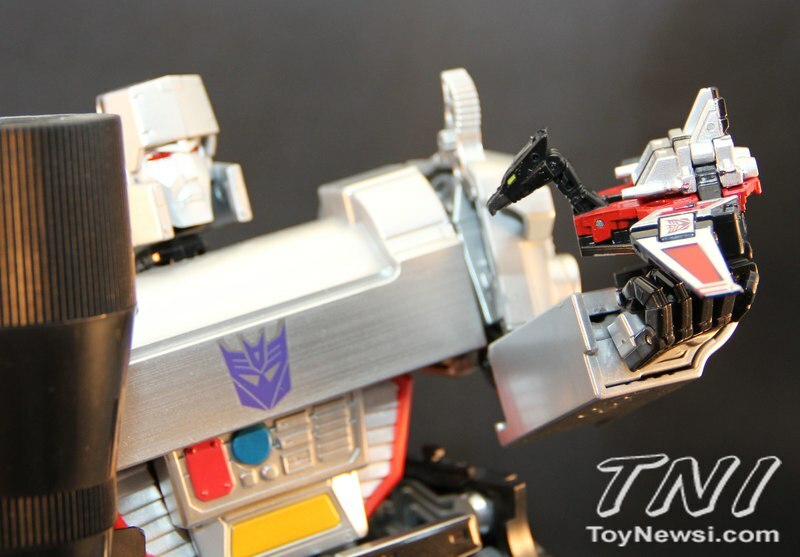 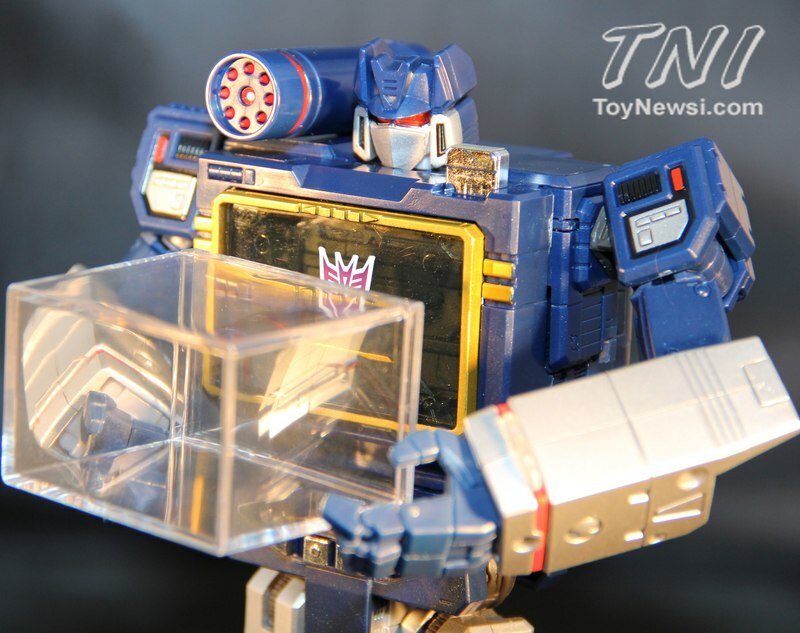 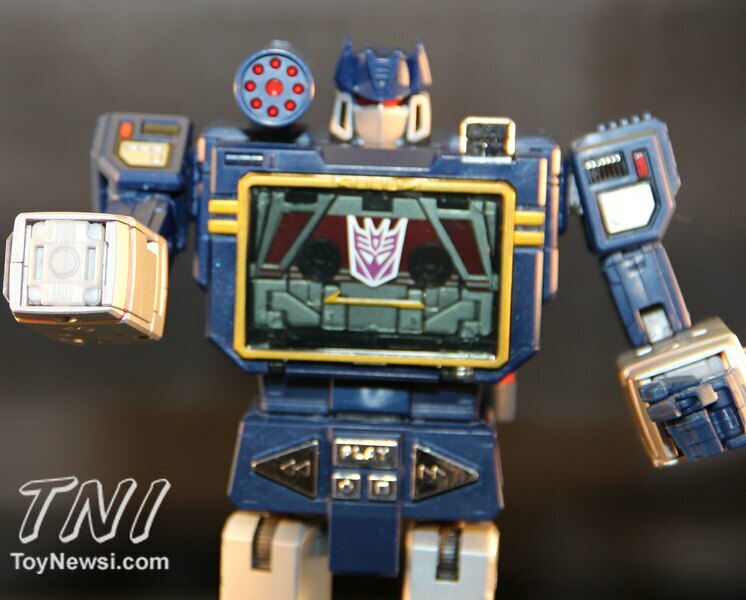 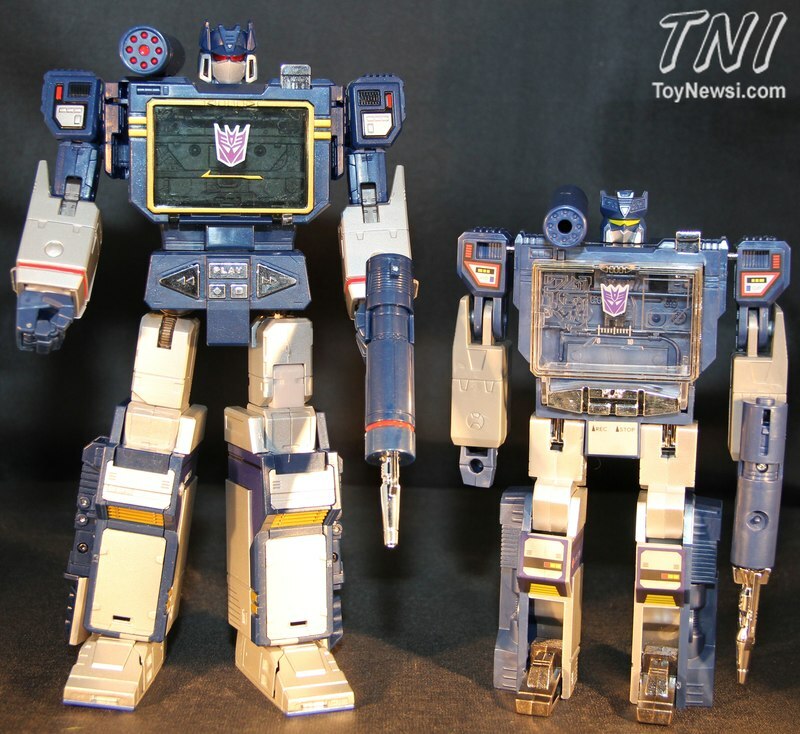 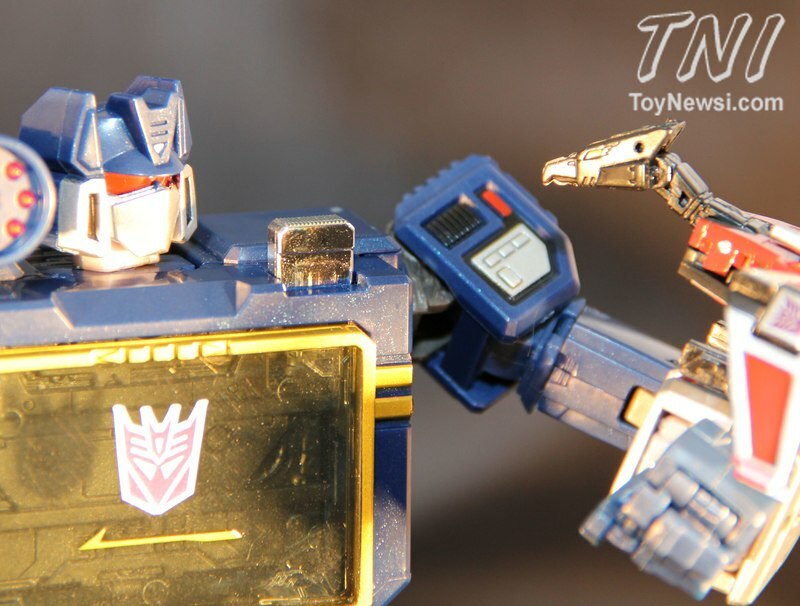 - Soundwave is chock full of accessories and features. He comes with the Laserbeak cassette, cassette holder for Laserbeak which is translucent pink so you can also pretend it’s an Energon Cube. 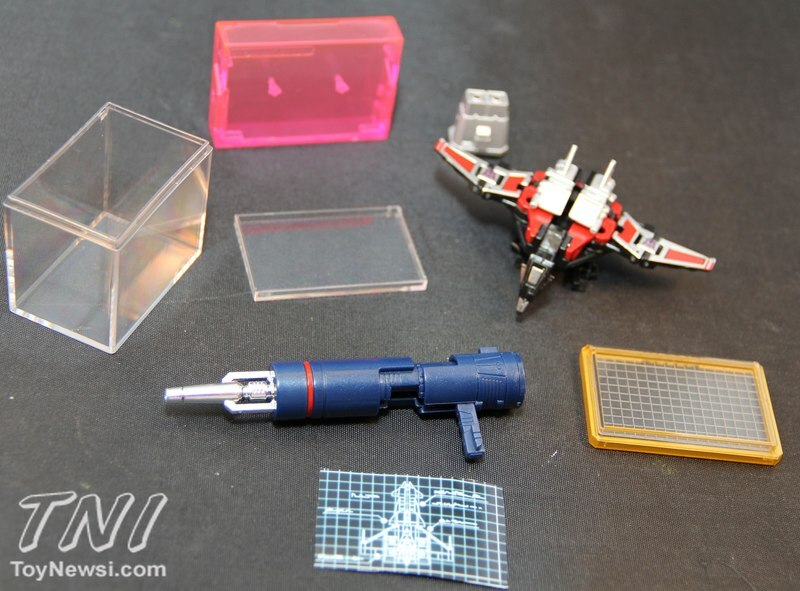 He has a clear Energon Cube that can attach to his chest with a special grid-looking piece so it looks like he is making them. 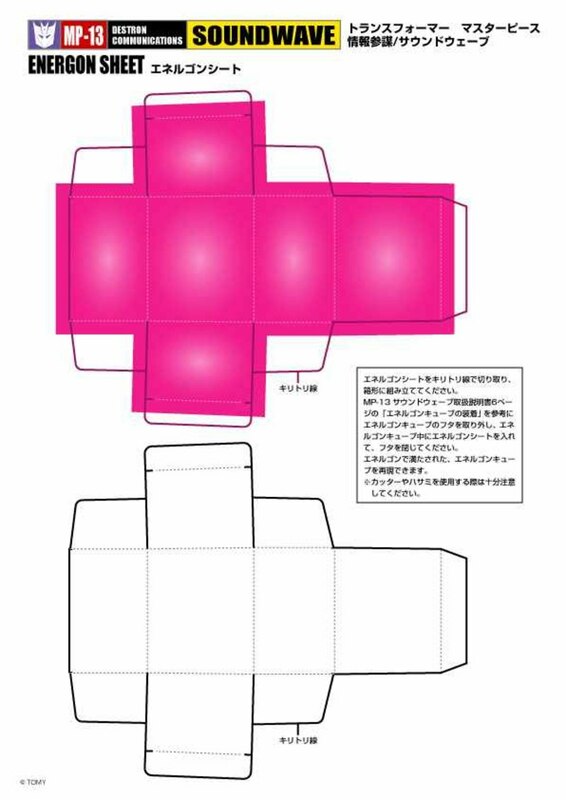 You can cut out a papercraft pink florescent piece of paper and put it inside the cube to make it look like it’s full of Energon. 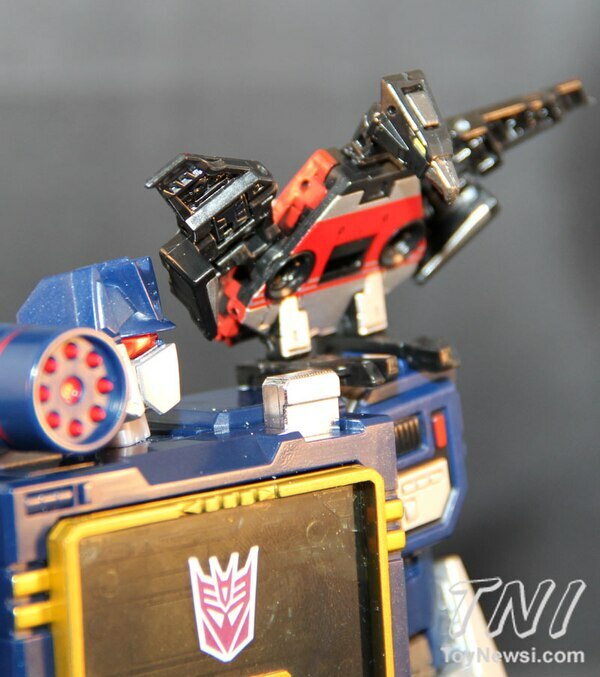 This cutout is available on the Takara website. 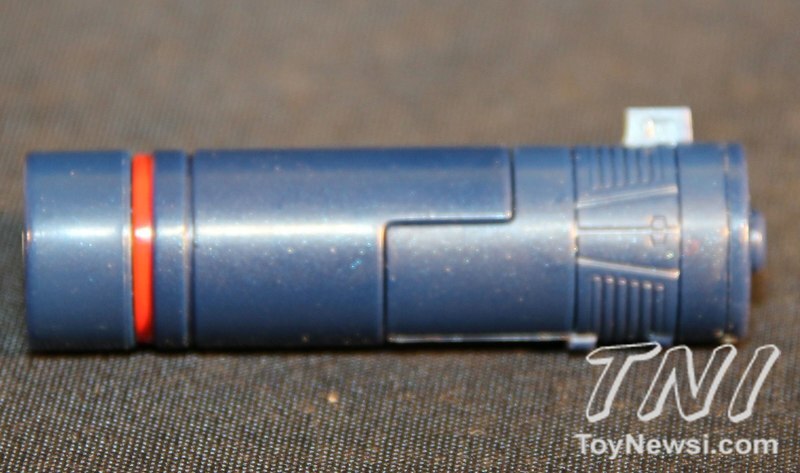 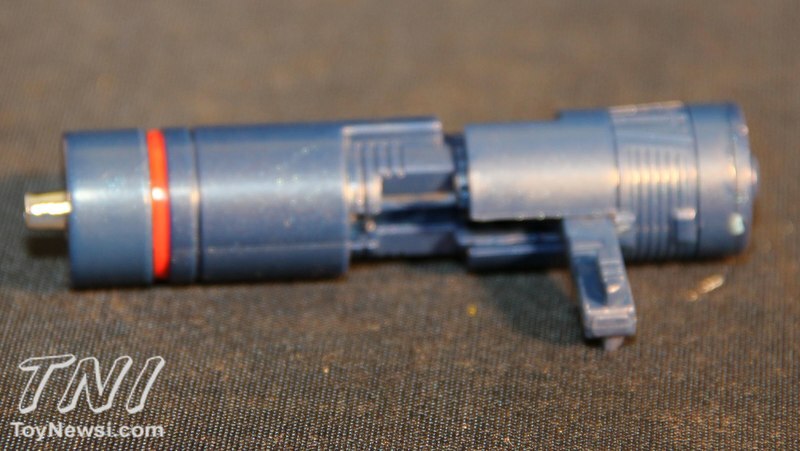 He comes with his traditional cannon that slides out to reveal the silver chromed missile like on the original toy, but the missile is not removable on this one. 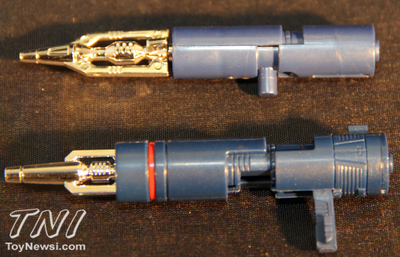 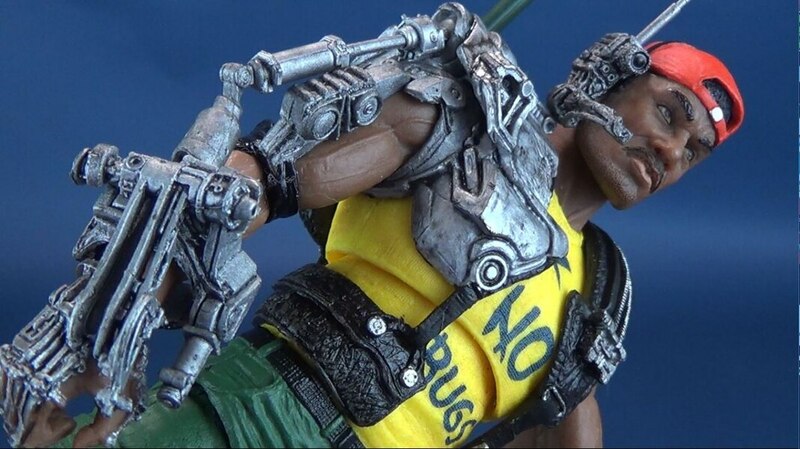 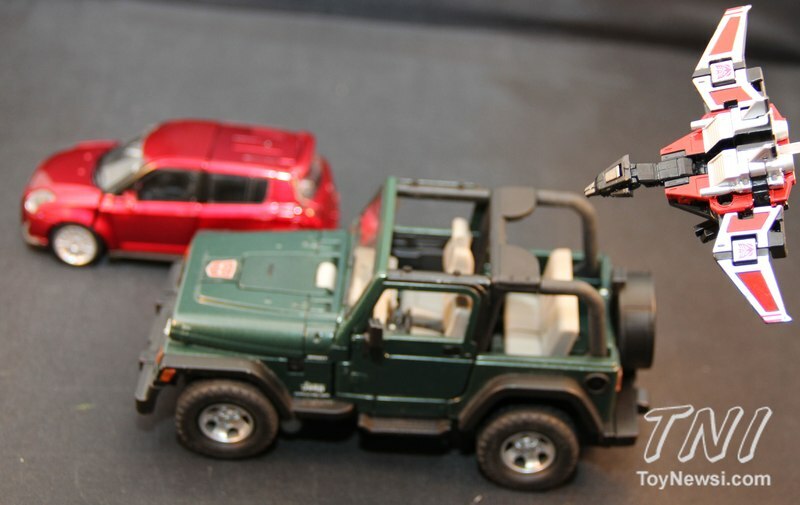 The gun also attaches to the figure’s back to look like a battery. 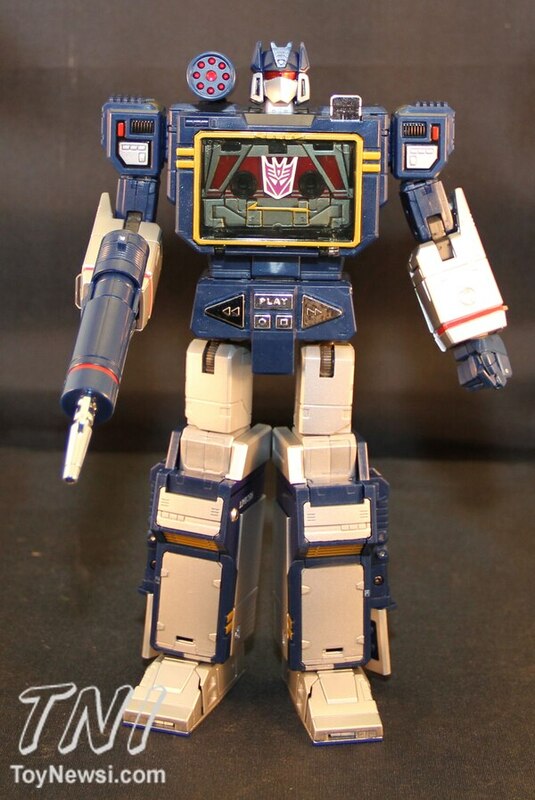 You can cut a blueprint for a Decepticon spaceship from the instruction manual and place it on his chest with the aforementioned grid piece so it looks like a digital display on his chest as seen in the cartoon. 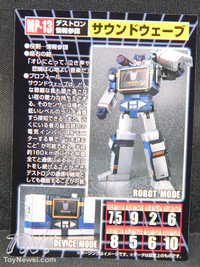 He has a scanner piece you can store on his back that will attach to his wrist if you fold it in either hand. 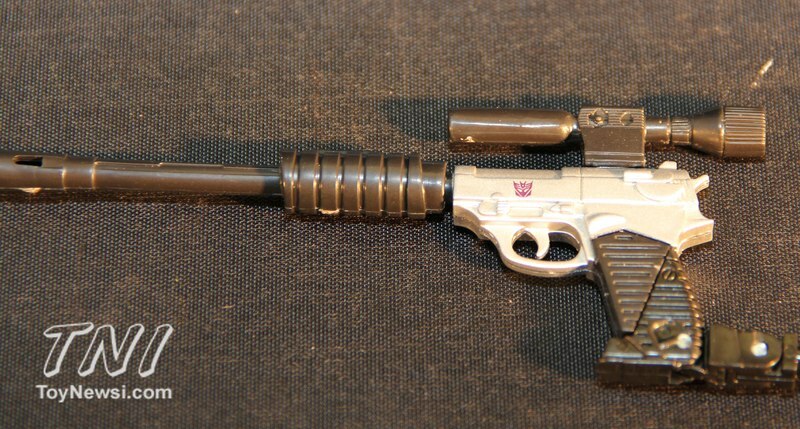 He comes with a replica of Megatron in gun form that he can hold and use. 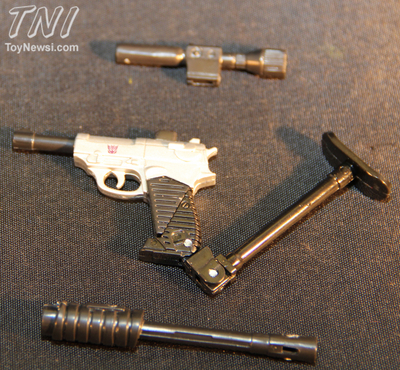 The scope, silencer and arm rest pieces are all detachable. 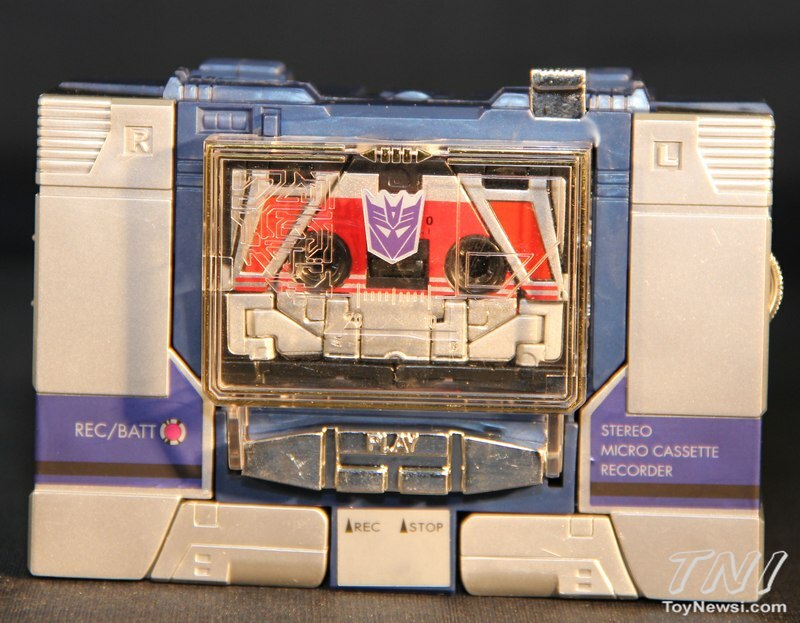 The cassette chamber can hold three cassette tapes at one time. 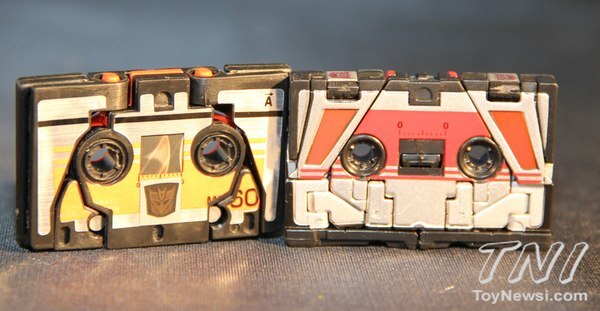 Both vintage tapes and the new MP’s will fit in there. 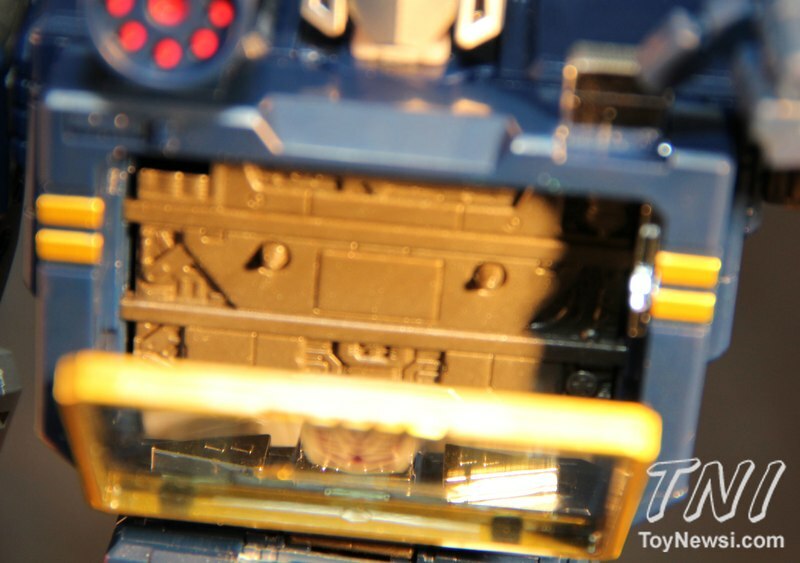 A button on the back of the figure moves a little wall-type device forward to push the cassettes out one at a time. You sometimes have to be careful that the cassettes don’t get stuck in there. I’ve had to use a knife to pry mine out a couple times. He also has some compartments in his legs that can be used to store accessories for upcoming Minions like Rumble and Frenzy’s piledrivers. 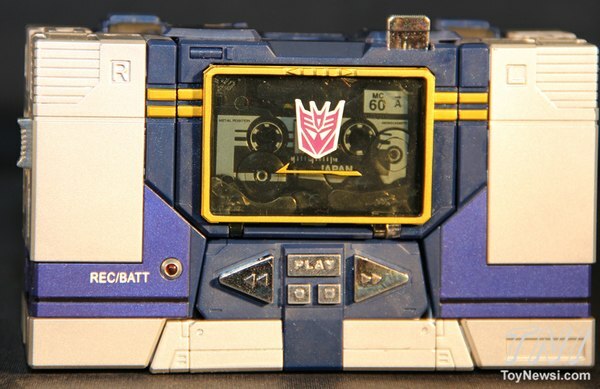 One final thing I noticed. 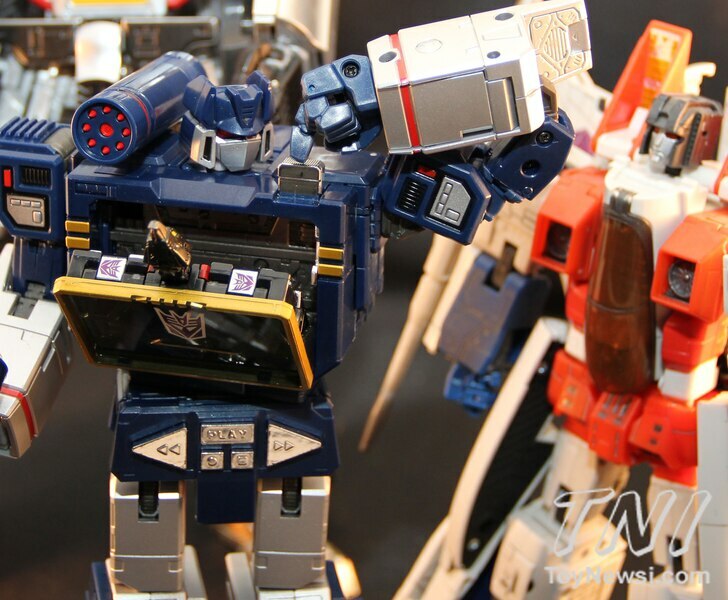 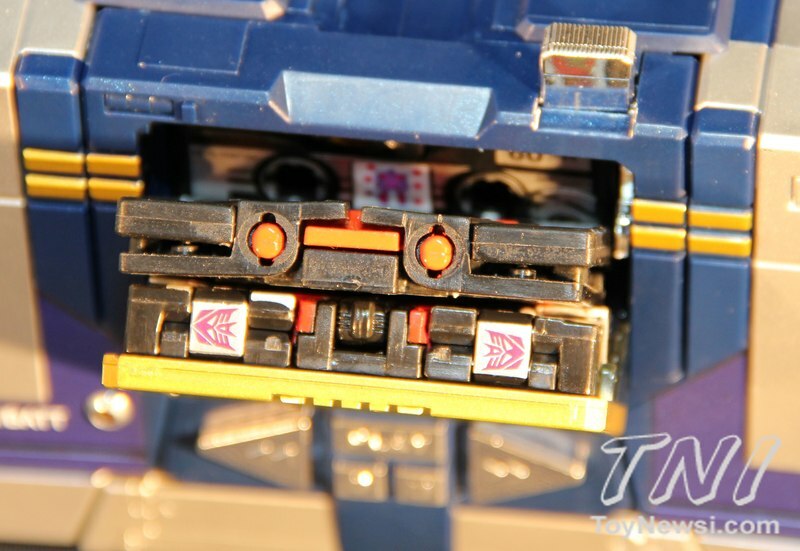 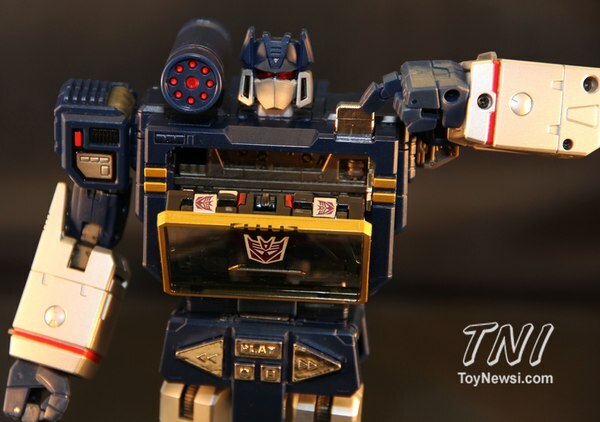 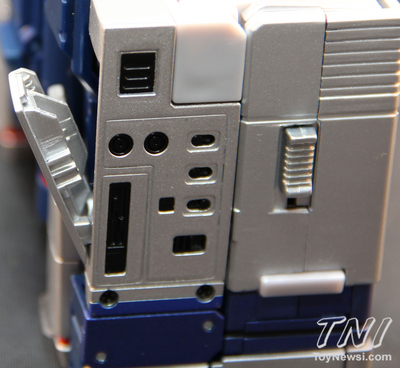 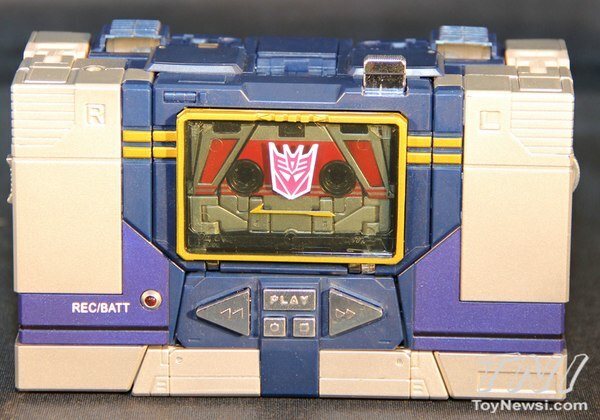 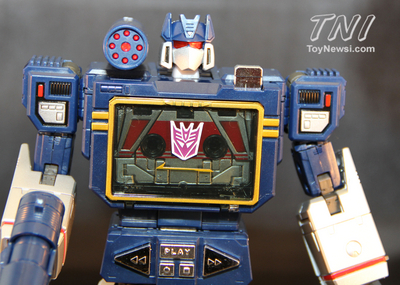 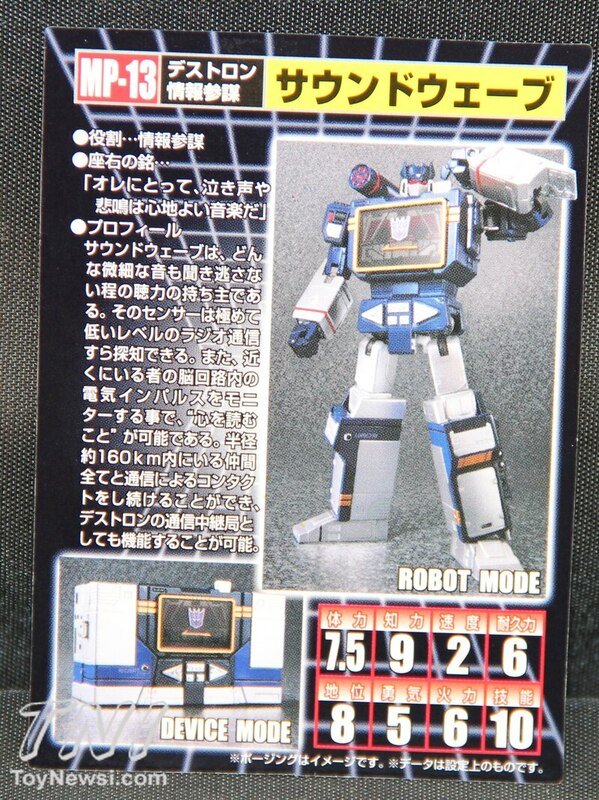 In cassette player mode, Soundwave has an earphone jack that you can actually plug real earphones into. Of course it doesn’t actually play any music but still it’s a nice little added touch. 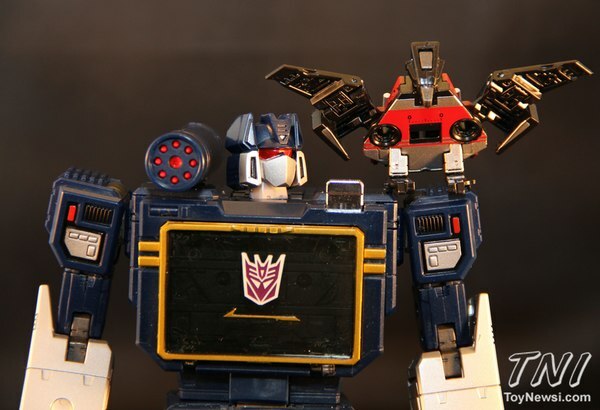 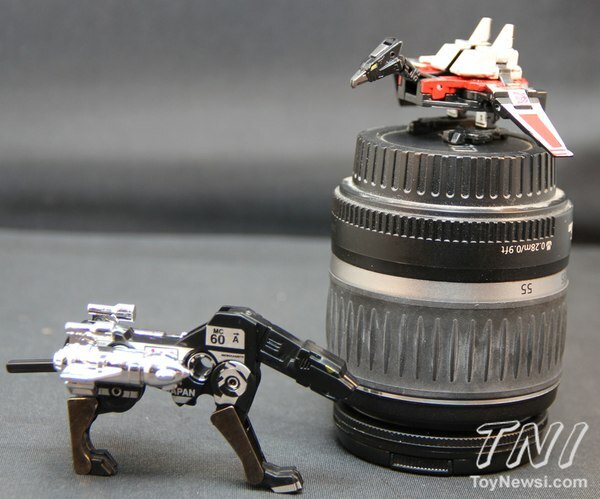 Laserbeak - has a little mini-camera that can pop out of his head like in the cartoon, and he has grooves on his legs that will fit a little clear piece of plastic on either arm so he can stay on Soundwave’s arms without falling off. You can also place Laserbeak on either shoulder of Soundwave and use the grooves to attach him so again he won’t fall off. 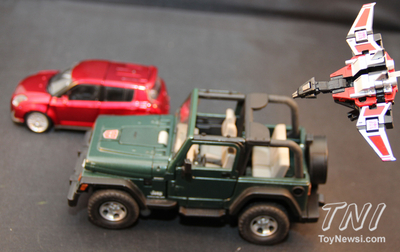 Fun - This figure is great fun and has so many cool features and accessories to play with. 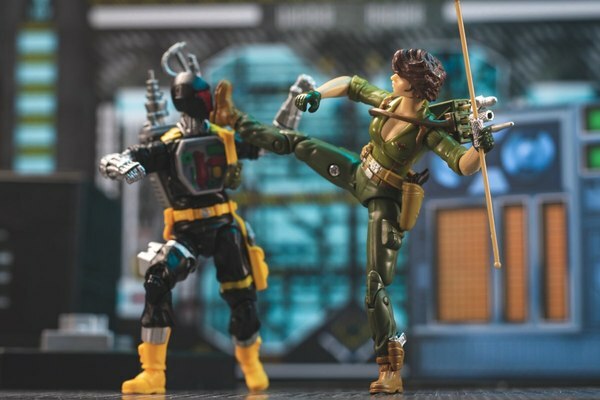 In fact, I found it difficult to write this review because I kept getting distracted with all the cool things you can do with this figure. 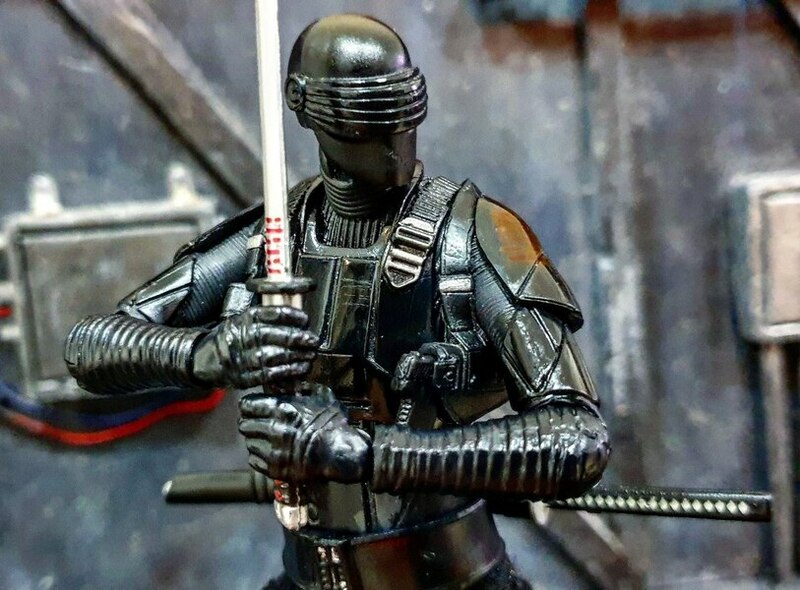 Overall - By far this is my favorite Masterpiece figure to date. 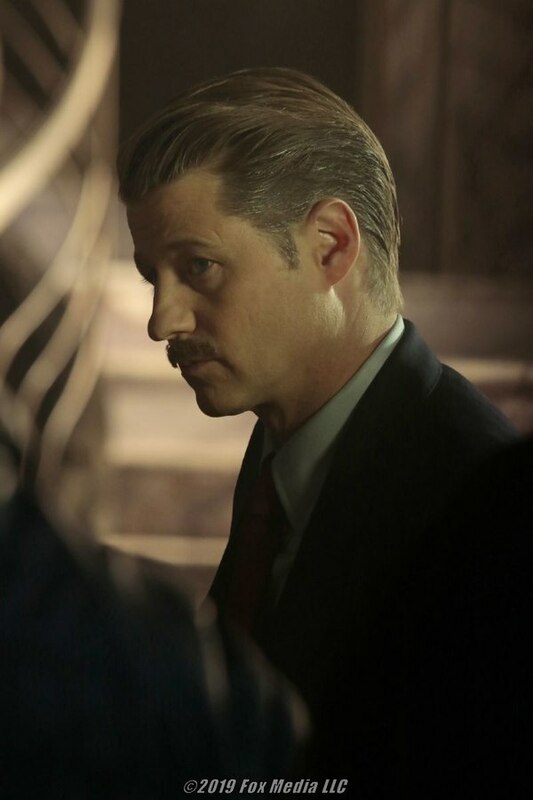 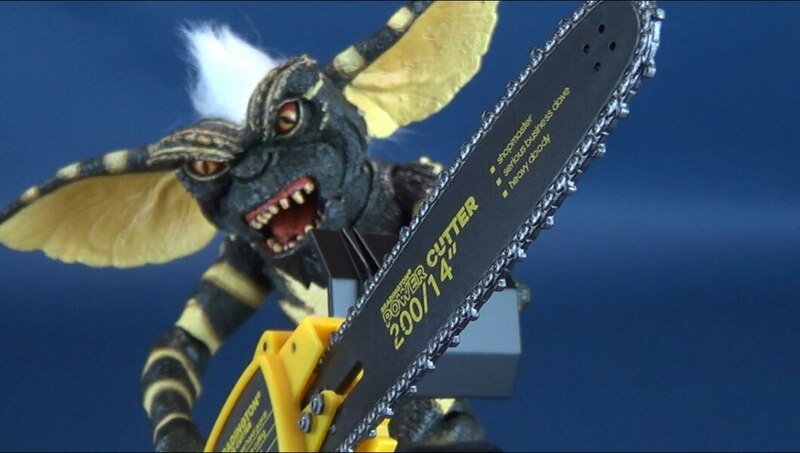 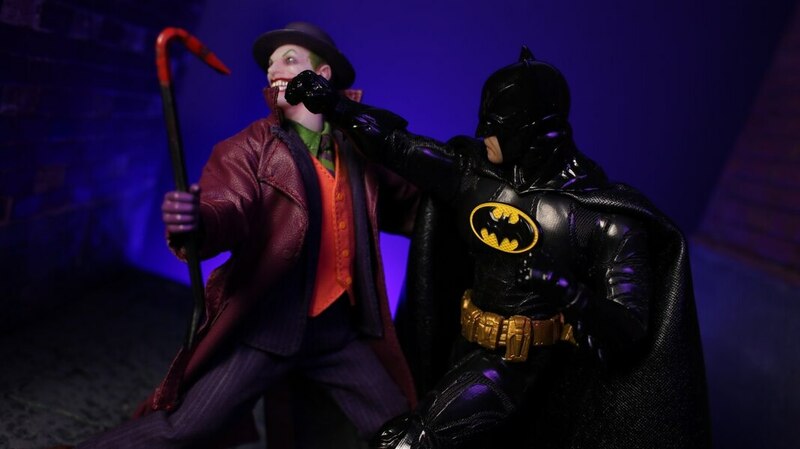 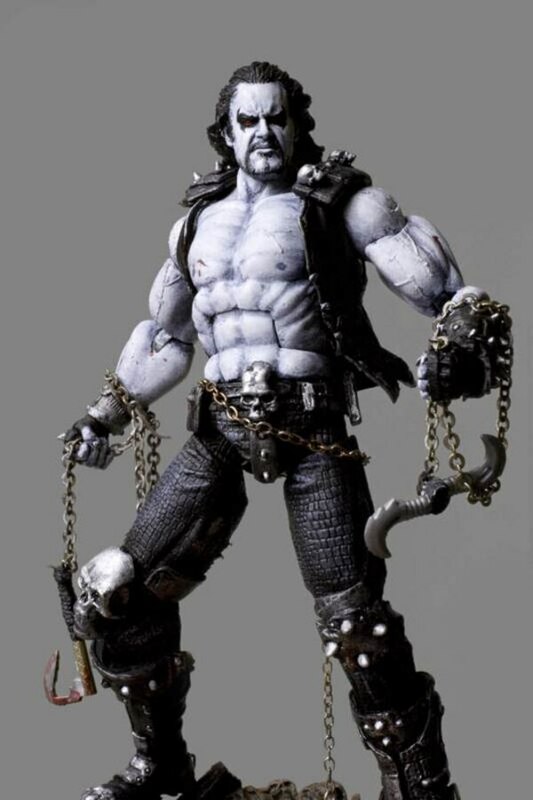 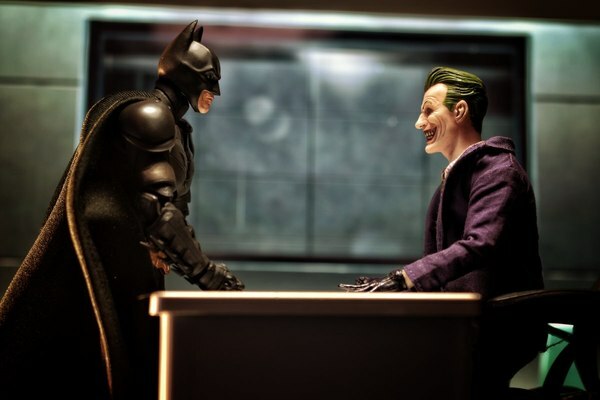 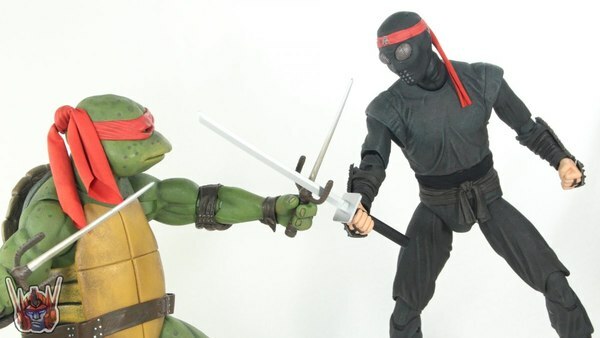 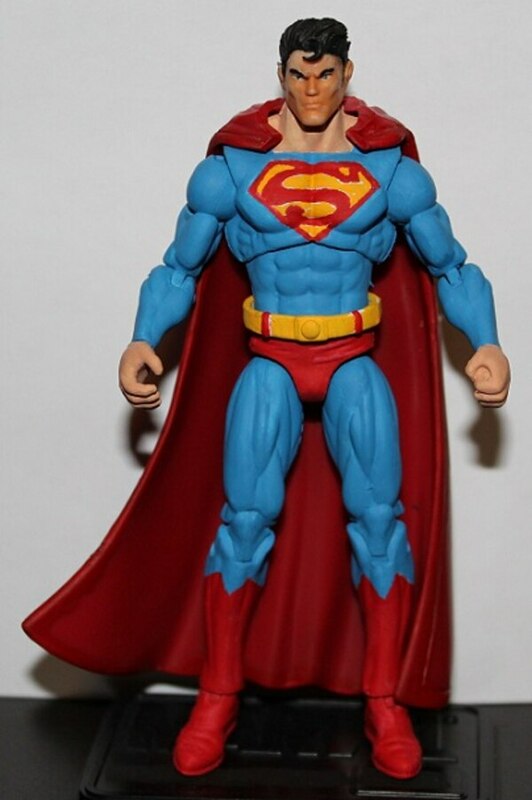 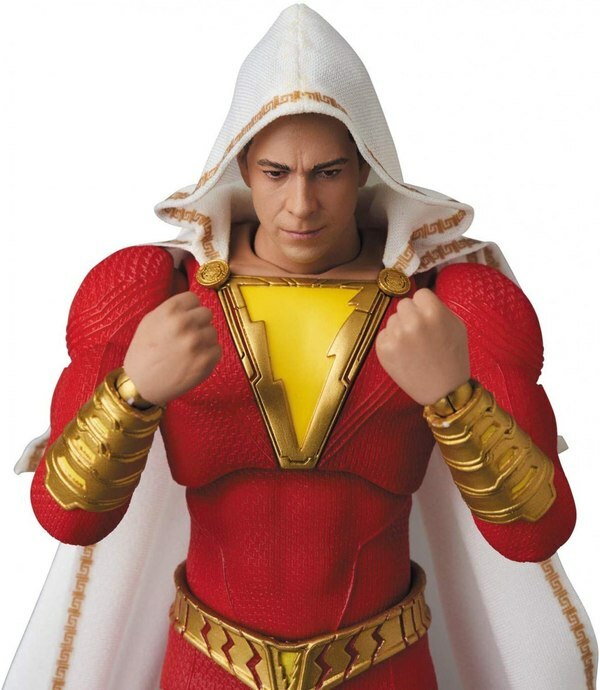 The likeness is dead-on to the character, and the toy is made very well. 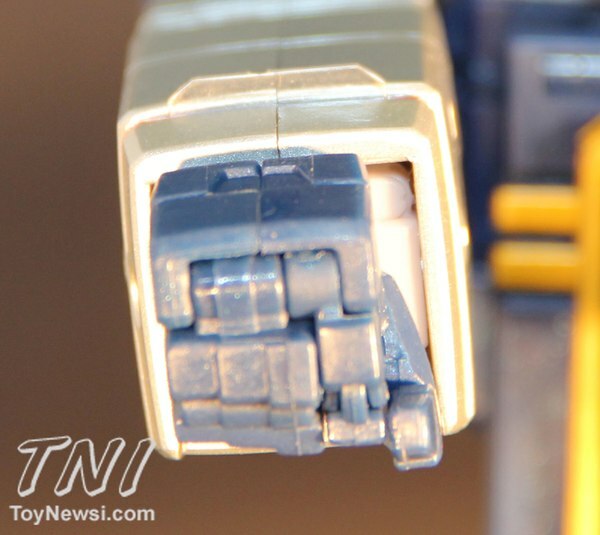 With many of the other MP’s, I feel like excessive handling could break the figure or loosen the joints but not with Soundwave. He is very durable and is by far the easiest MP to Transform to date, not including Laserbeak who is even simpler to change. 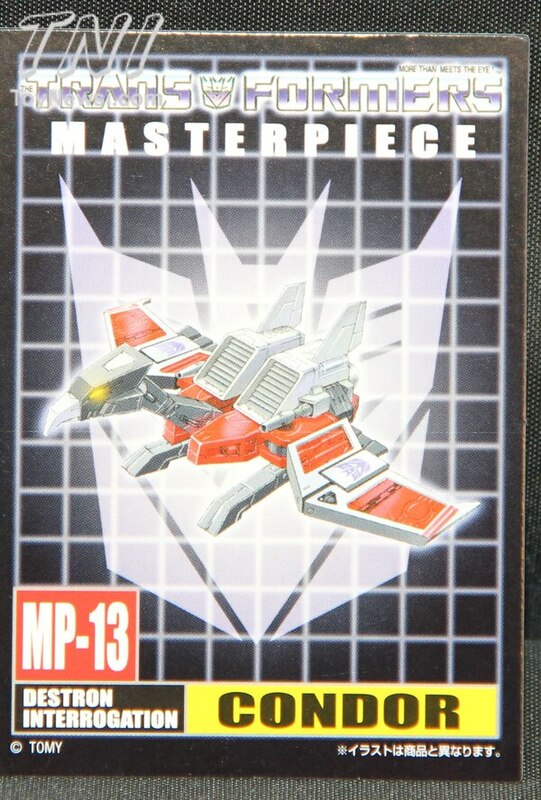 This is the ultimate MP and I highly recommend you get it. 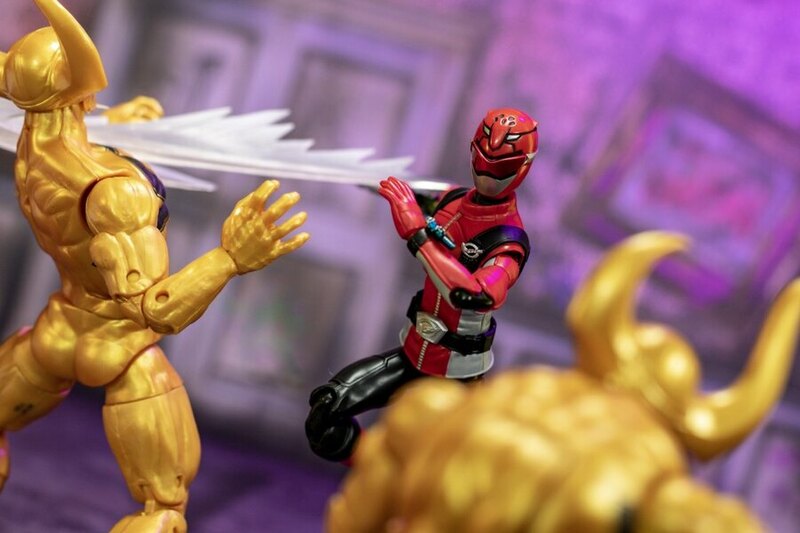 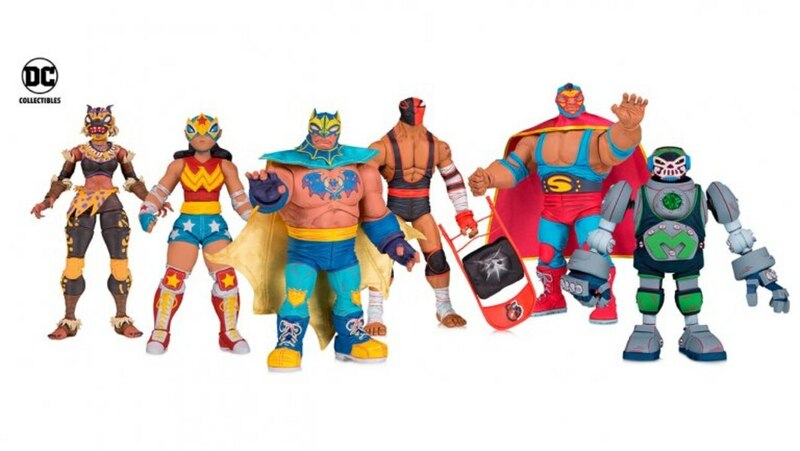 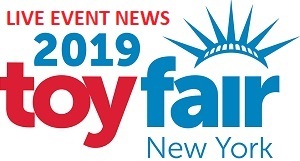 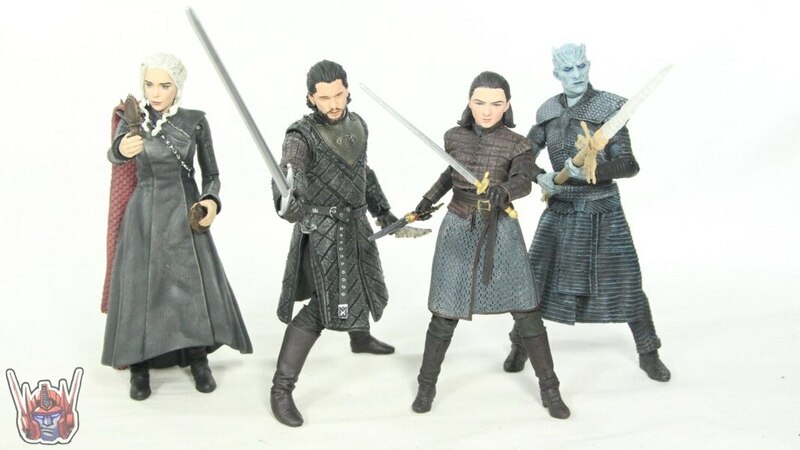 The only reason I might hold off is because it does look like Hasbro will be releasing a US version in the coming year which would obviously cost less.